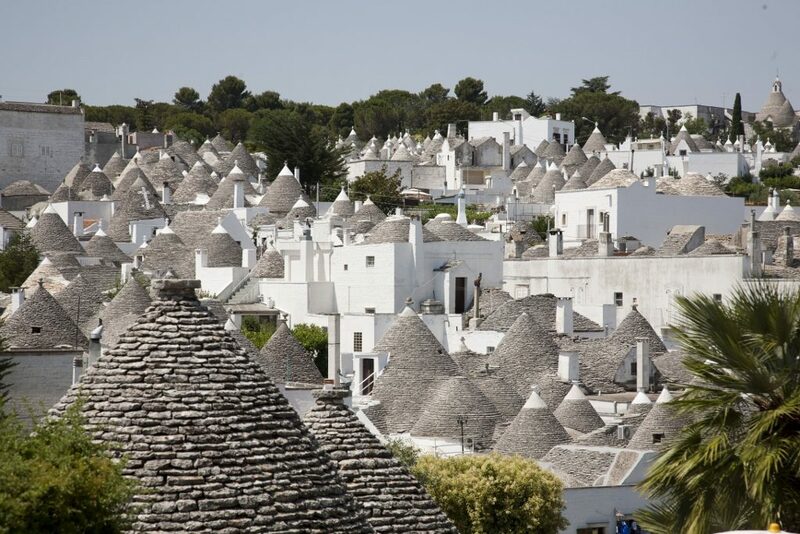 Space, rest, culture, delicious food and beautiful historic cities girted by natural and rural areas. 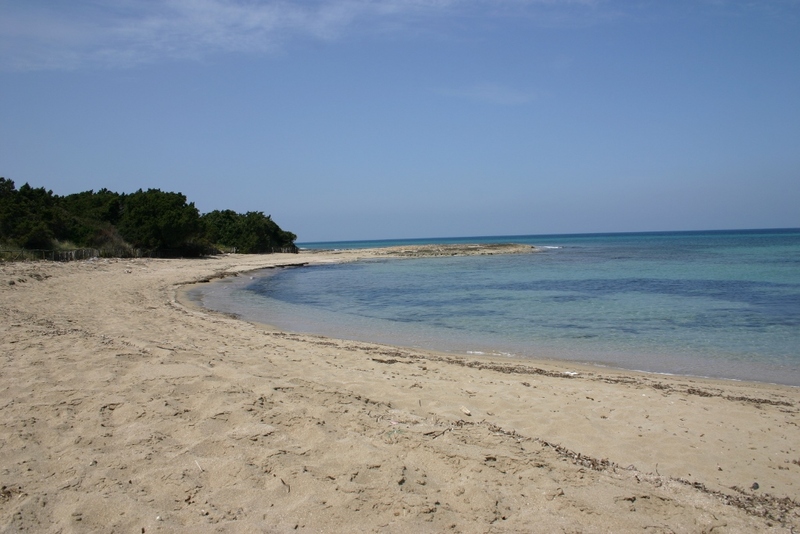 The Adriatic coastline at only15 km distance. 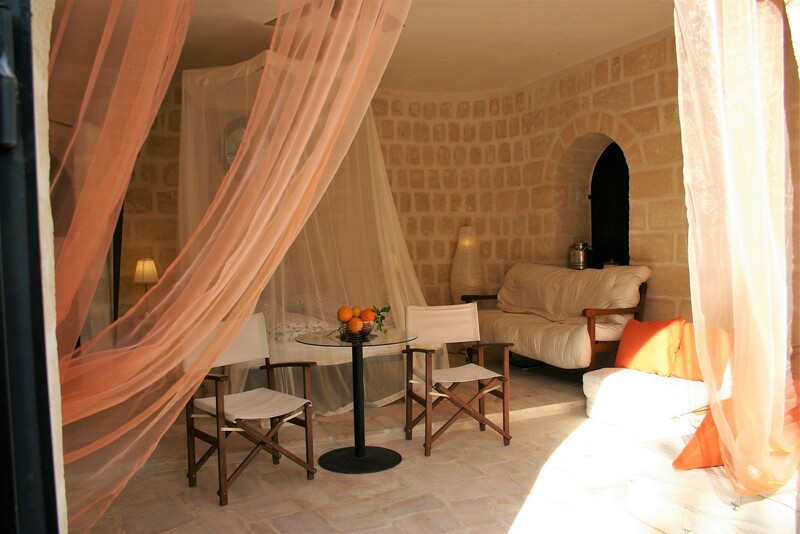 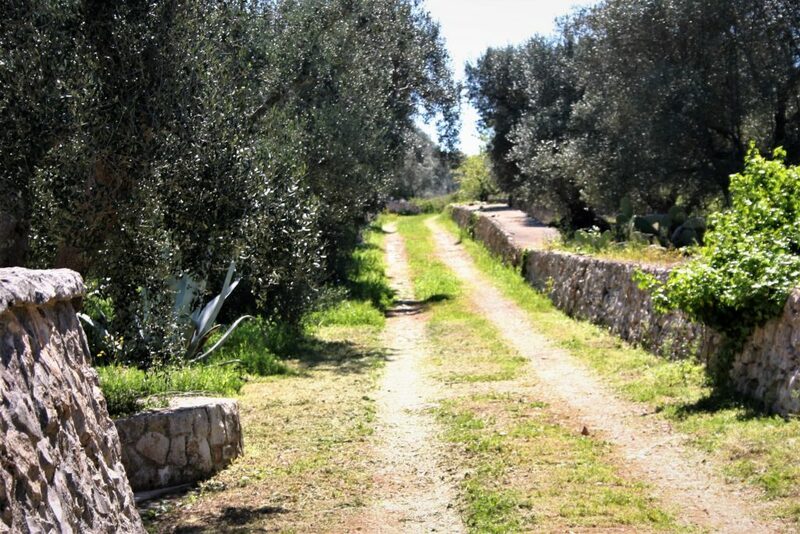 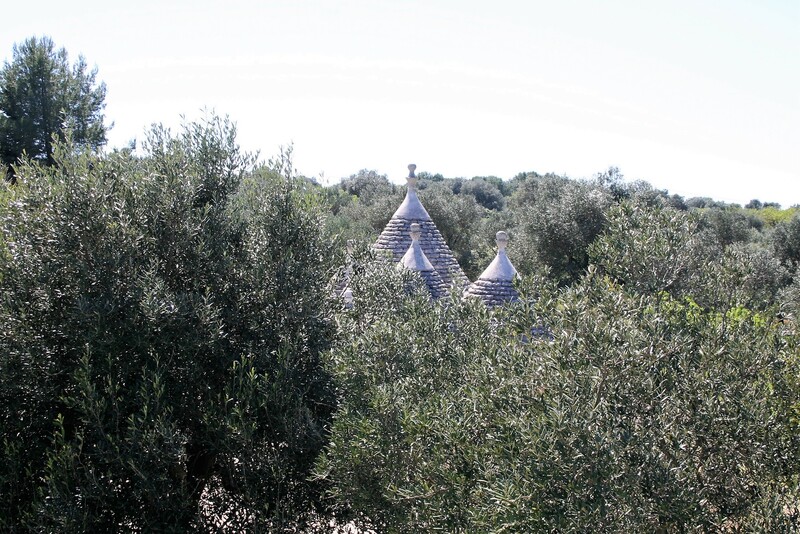 Hidden between the olive trees, right in the centre of Puglia are our traditional built trullo and our romantic lamia on 10.000m2 private ground. 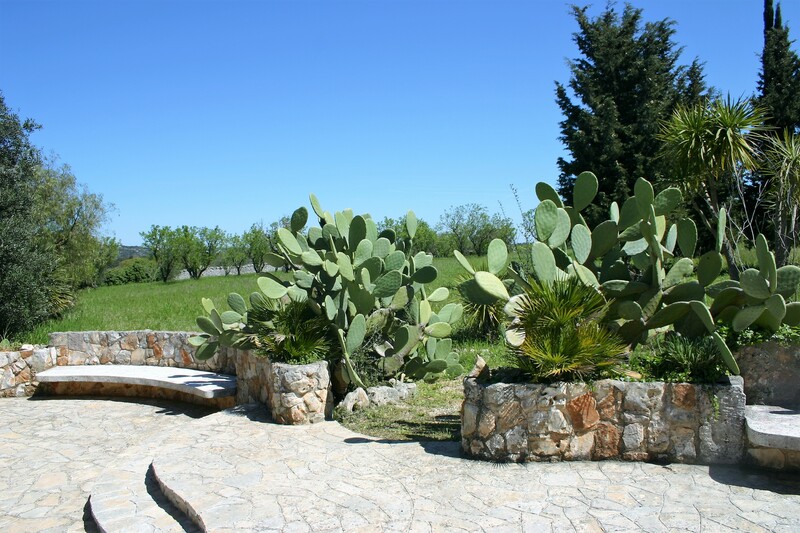 Just 7 kilometers distance from “la Città Bianca” Ostini and the nice town of Cisternino, we created a perfect spot to discover this unspoiled part of South Italy. Alberobello, Lecce and Matera with their colorful markets, genuine Italian shops and stylish restaurants, where you can have your dinner for a give-away price. 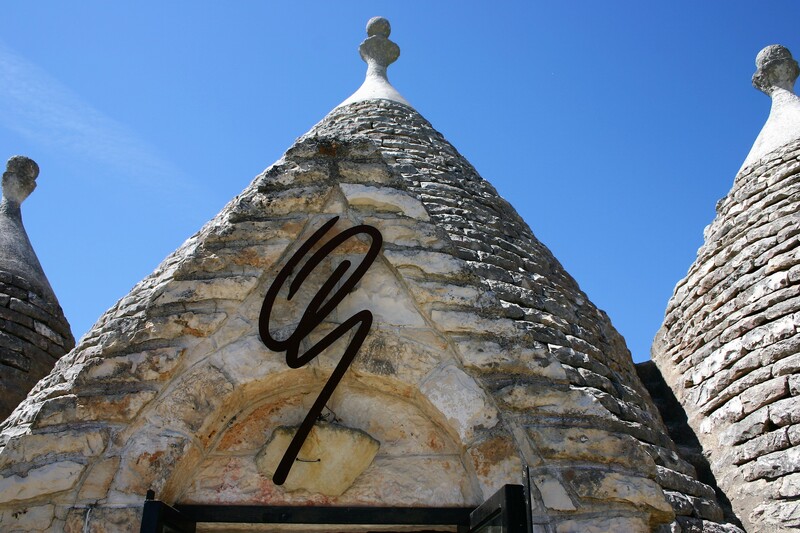 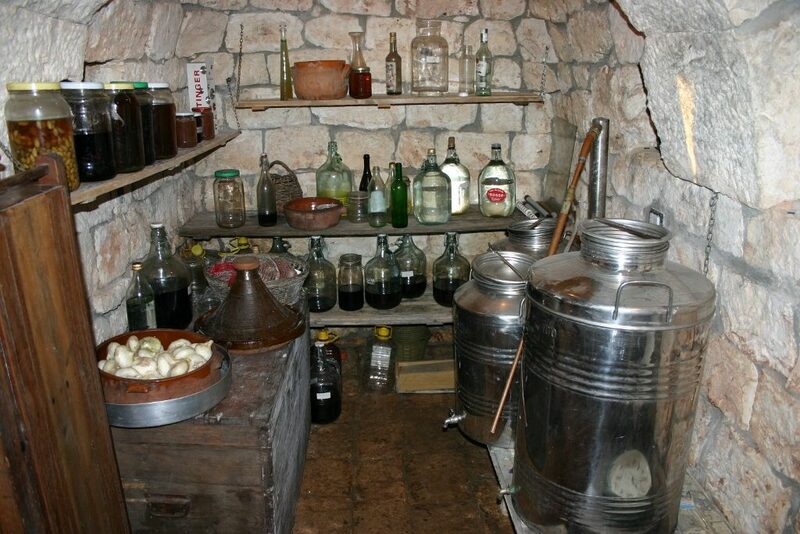 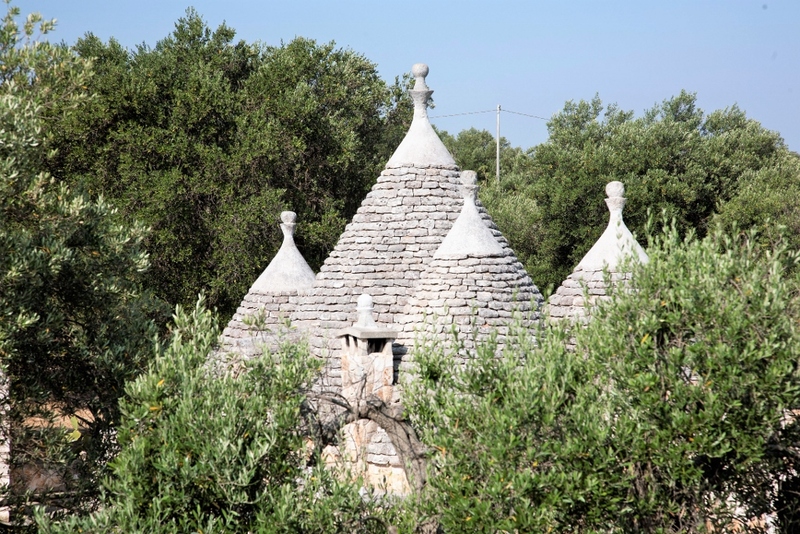 A trullo has a very speciﬁc architecture, which only appears in the region of Bari, Brindisi and Taranto. 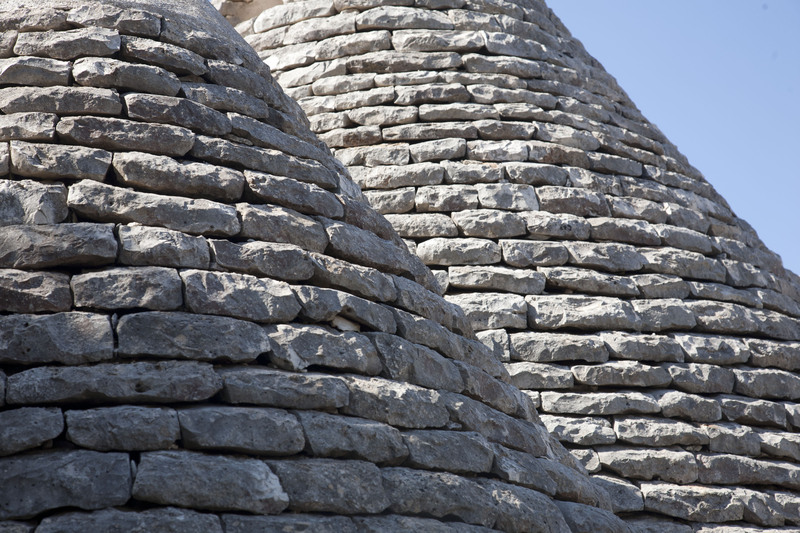 Cone shaped domes rest on thick cement-less walls, protecting against the heat as well as against the cold. 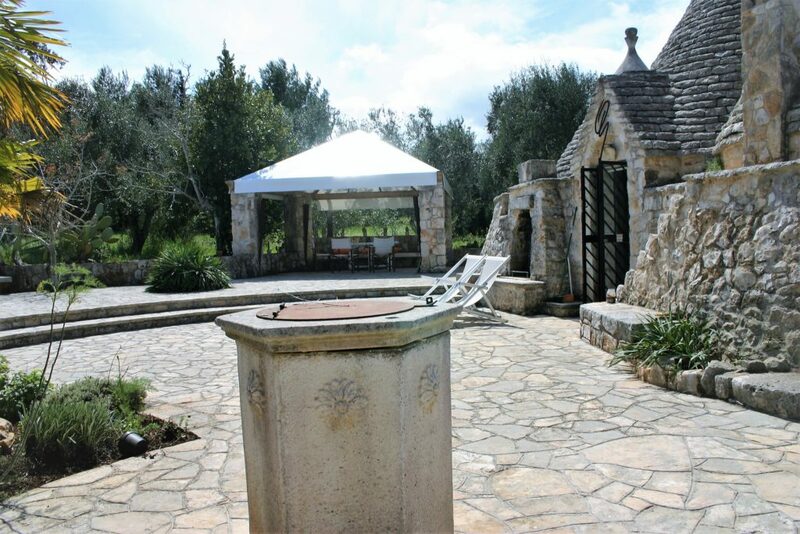 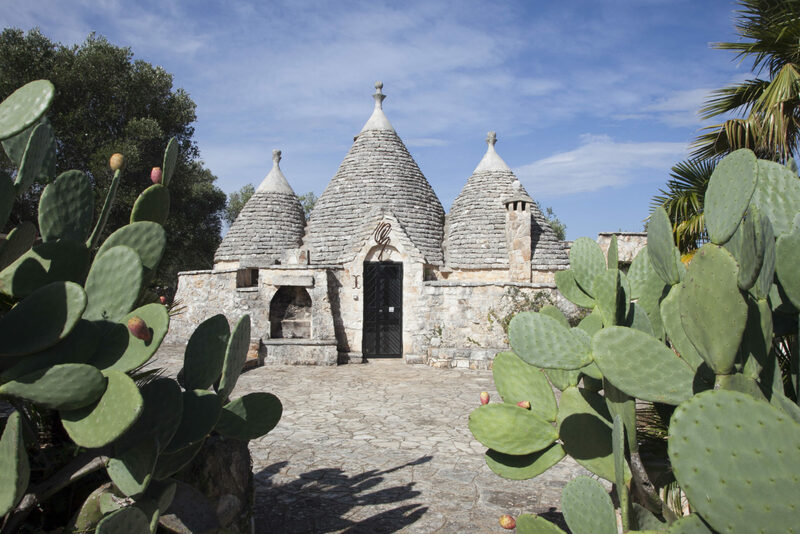 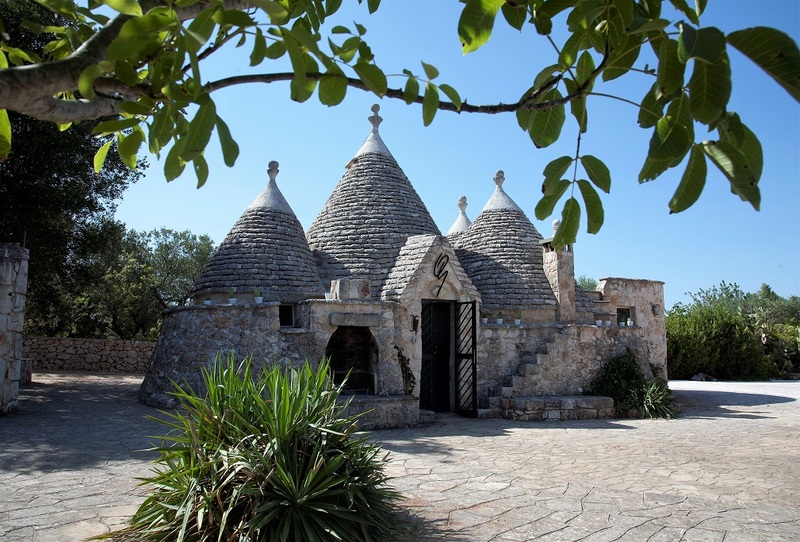 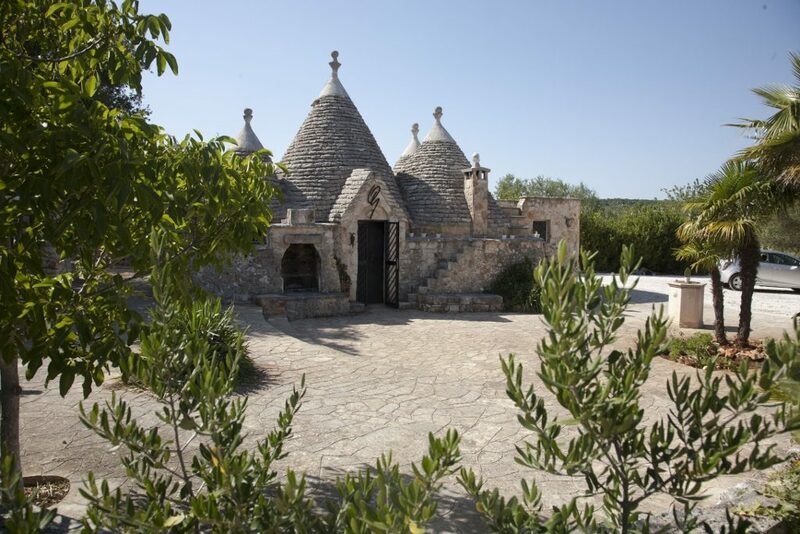 Trullo dell’Attore has been fully restored. There is a kitchen, a little sitting area, a bedroom with a double bed and a spacious bathroom with a shower and a toilet. Outside there is a enjoyable terrace with a covered dining area and a ﬁre place which you can use as a barbecue as well. 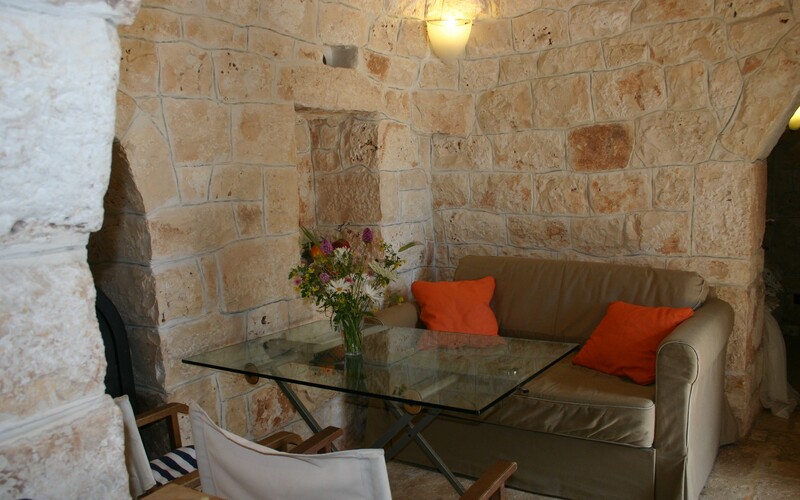 Further there is free wi-ﬁ, a dvd player, a wood stove and a sofa bed in the sitting area. 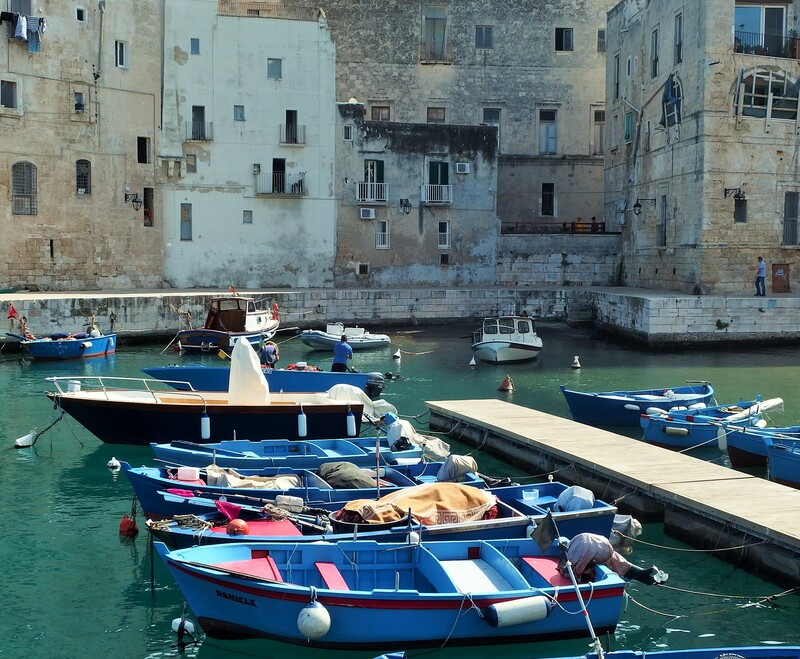 There is more than enough parking place. 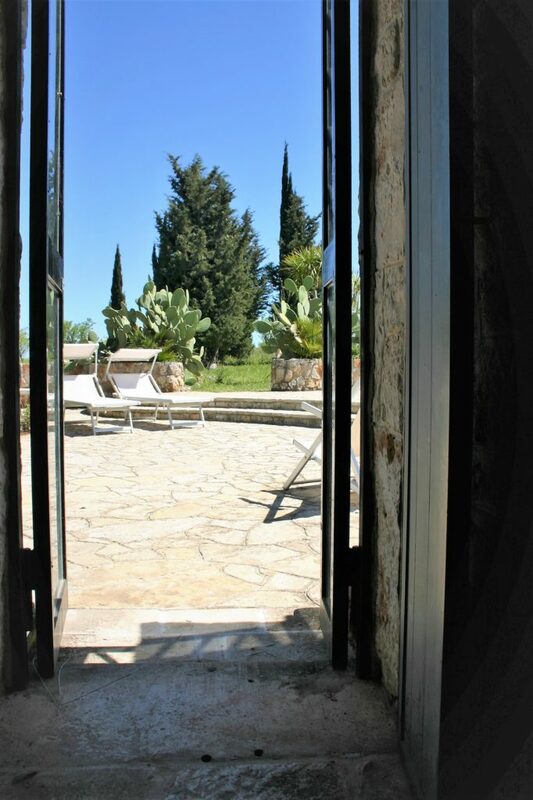 Our lamia has been built with a view of the Italian way of outdoor living, with two huge folding doors bringing the outside in. 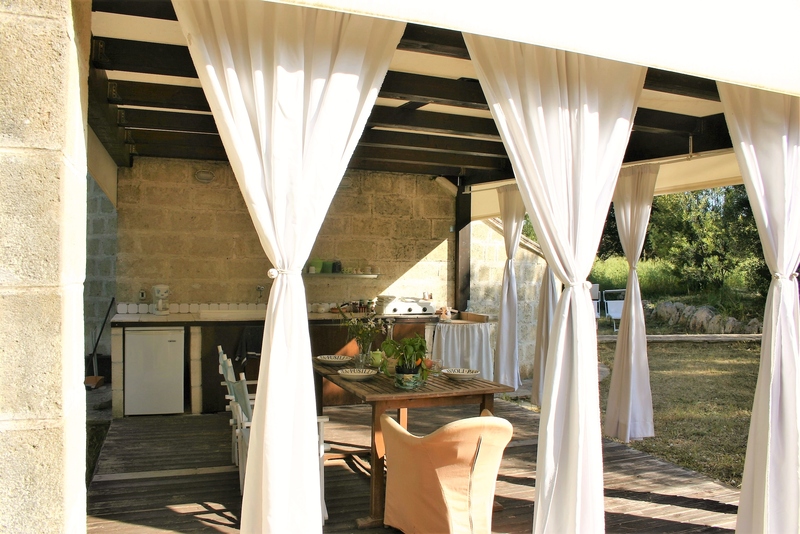 A well equipped outdoor kitchen with a spacious covered dining area making your meal a pleasure. 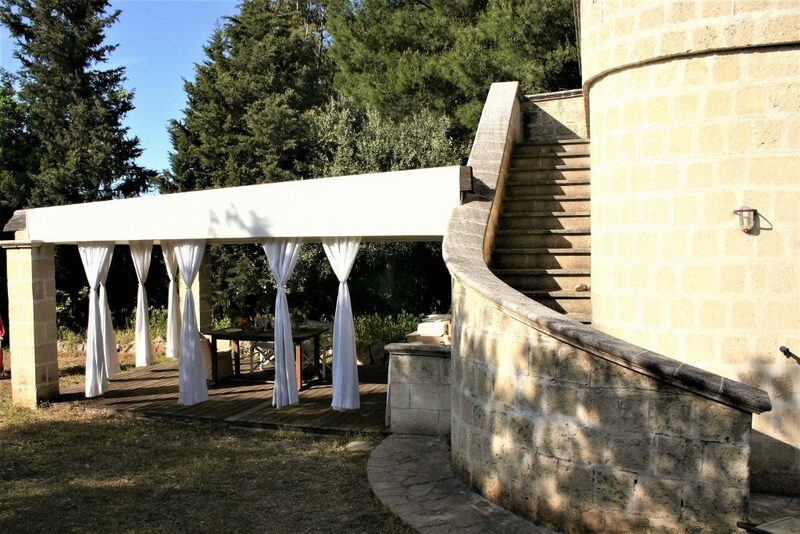 There is also 'that' marvelous roof terrace with great views. 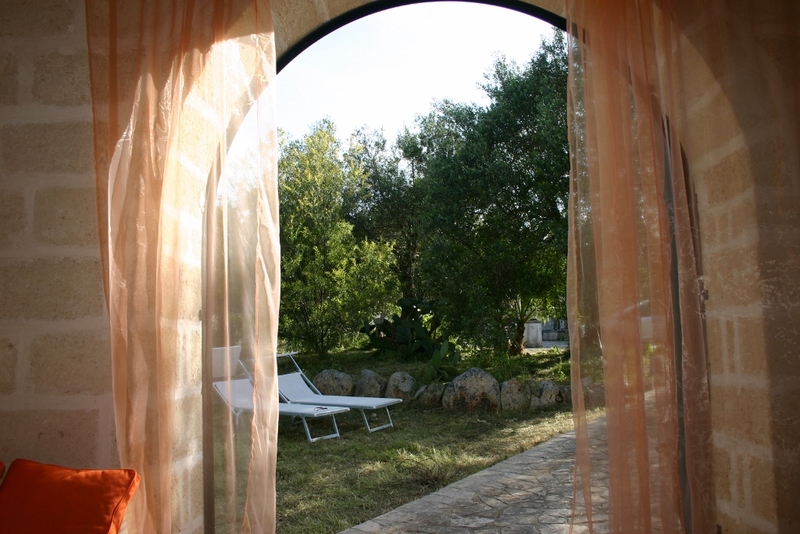 After a day of exploring the environments it is a pleasure to come home. 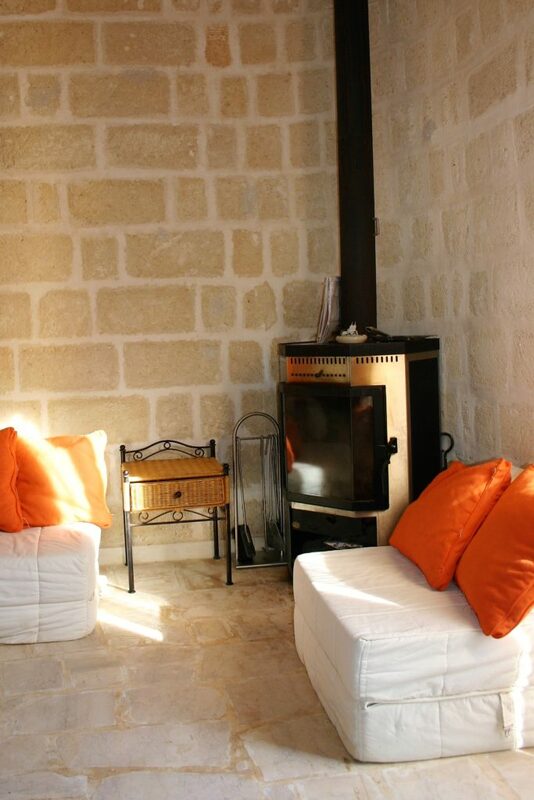 But a day around the house, relaxing might be a option too. 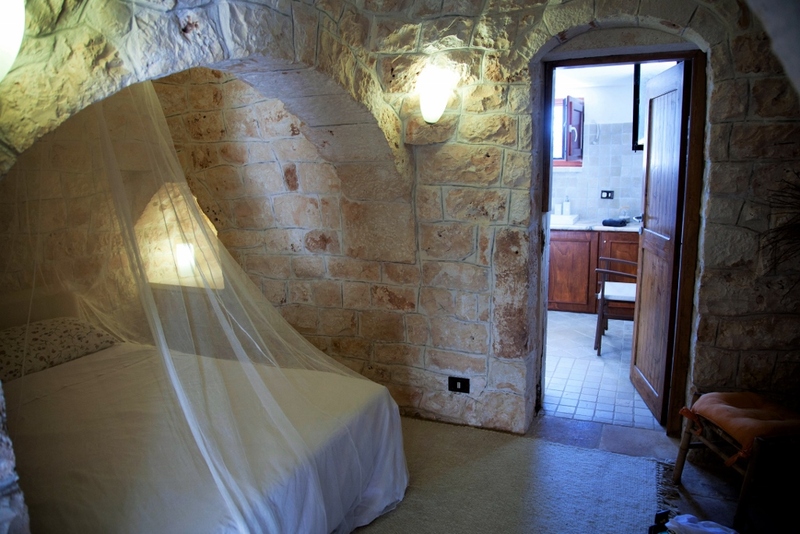 The lamia consists of one huge room with a double bed and a separate shower area. 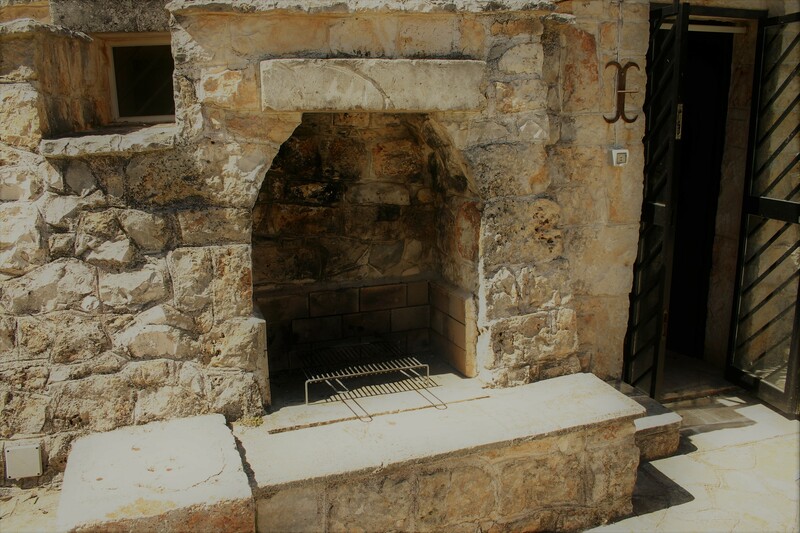 As said there is a outdoor kitchen and a lot of freedom to enjoy.parkeerplaatsen en gratis wifi. 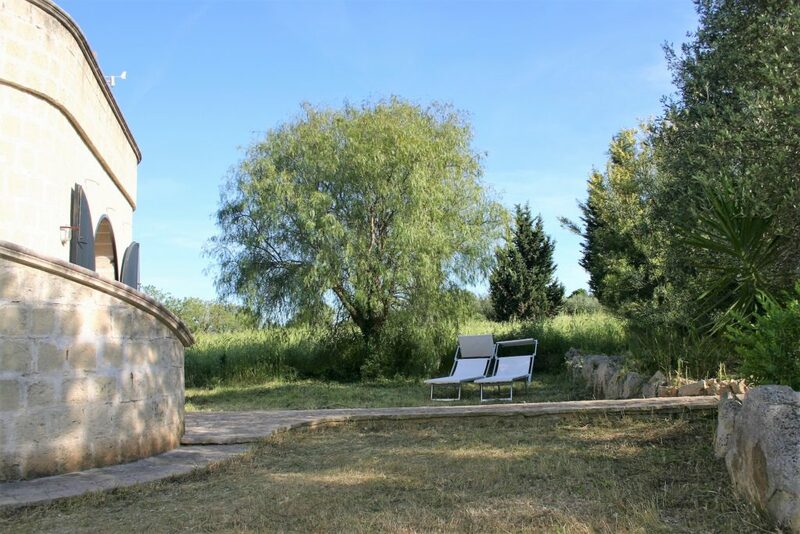 Although the trullo and the lamia are in a rural area, within a few minutes drive you are in the near by village of Casalini. 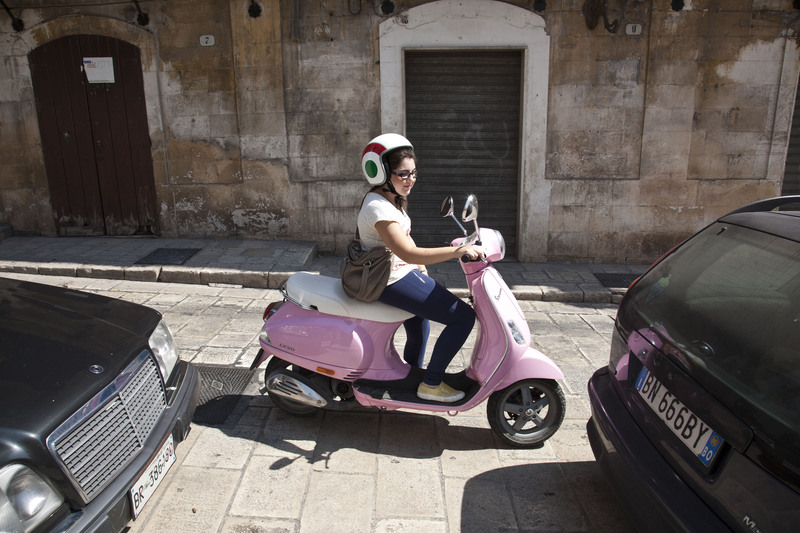 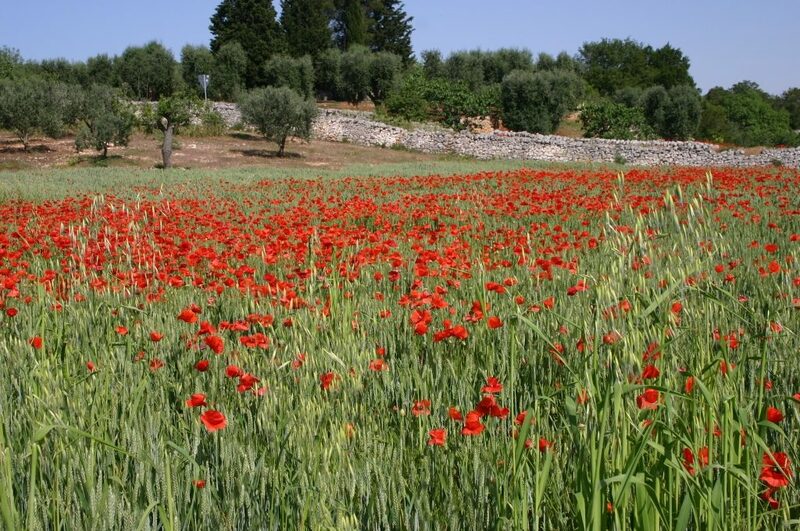 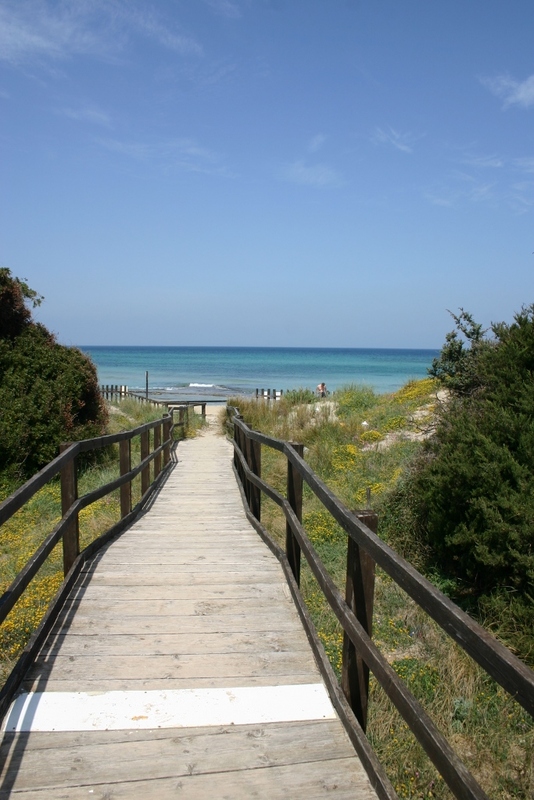 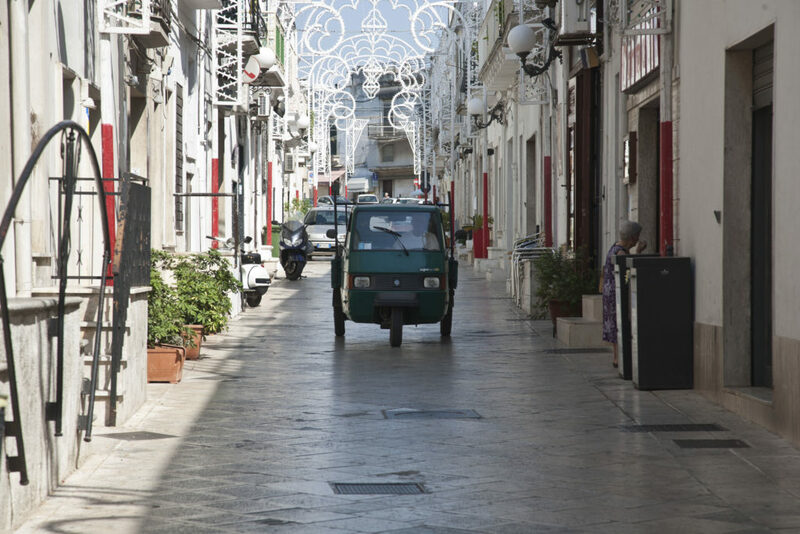 A 7 km drive will take you to the beautiful towns Ostuni and Cisternino. A 15 minutes drive by car and you can wade in the sea, where you have a good view at the freakish mass of rocks or maybe a rest on a deck chair at one of the many beaches. 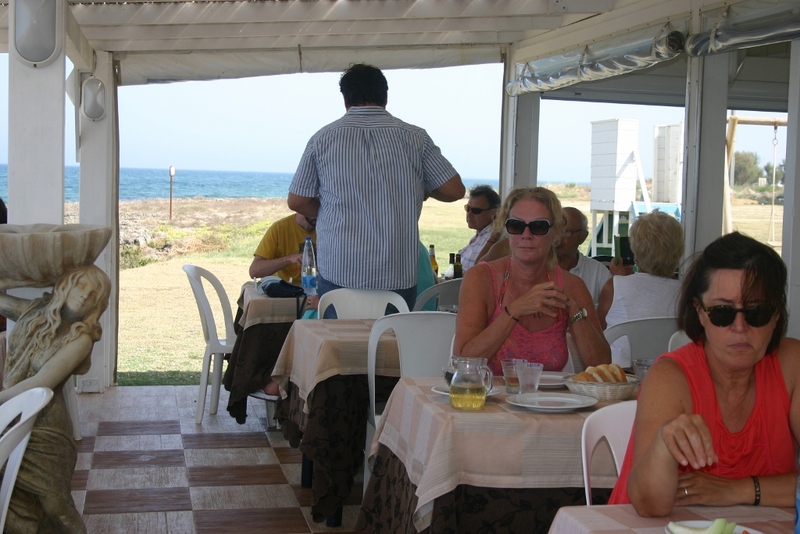 There are surprisingly really good little restaurants at the beaches. 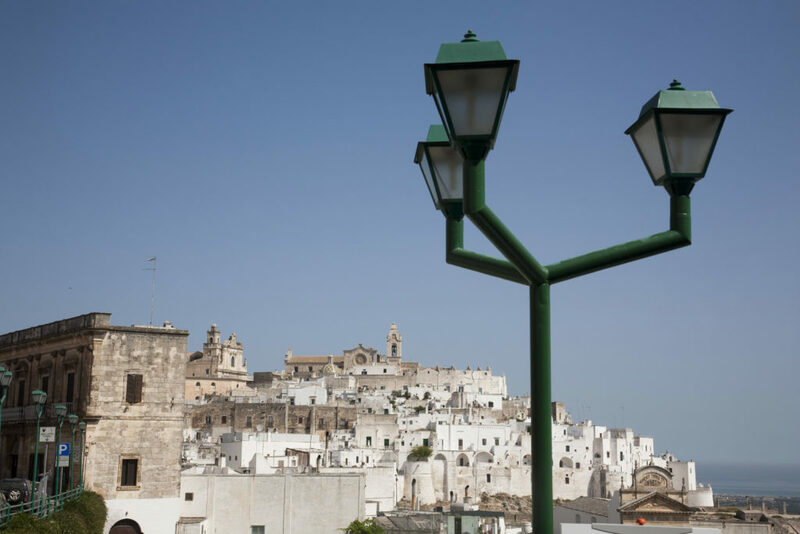 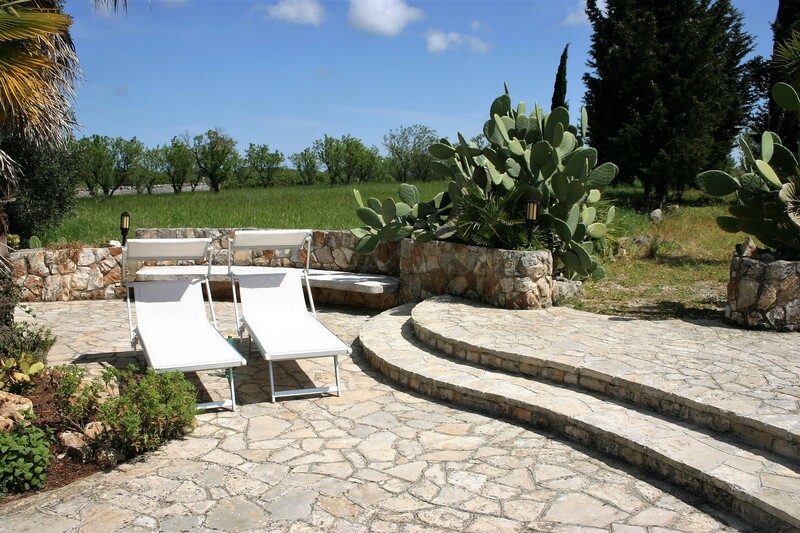 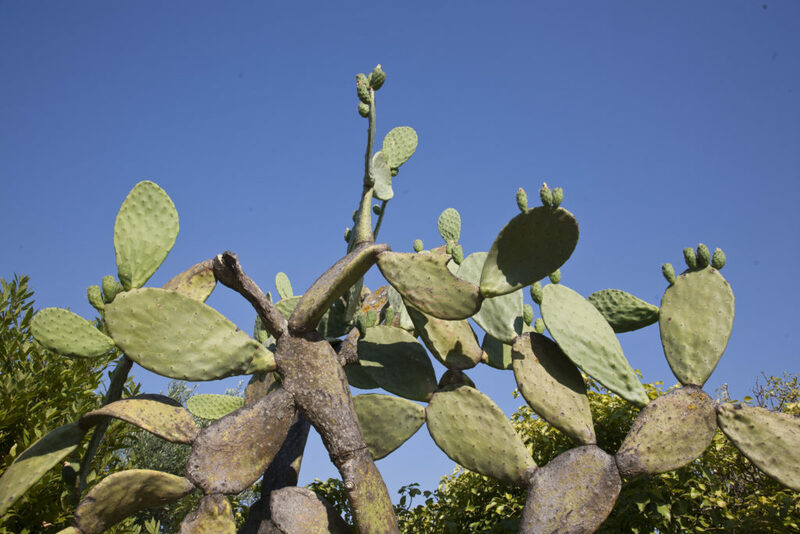 Ostuni is situated on a hill, which you can see from a far distance. 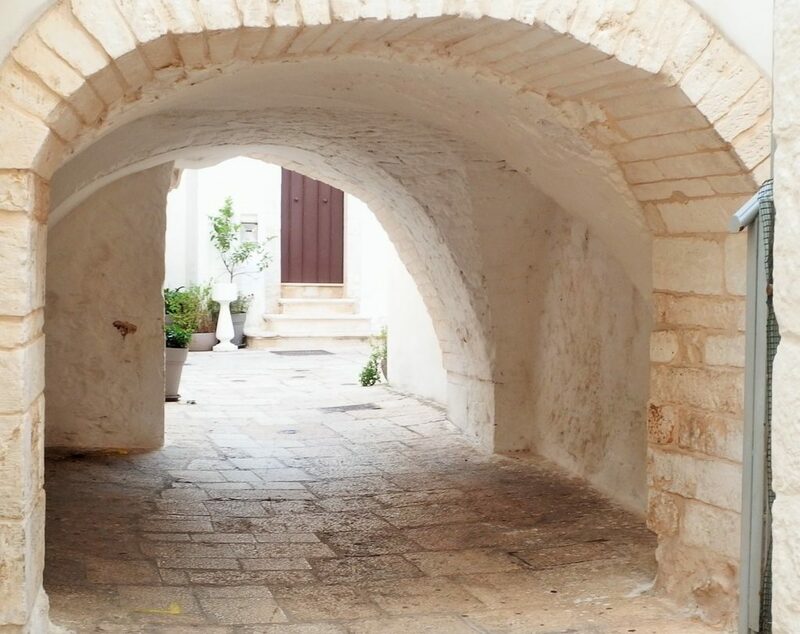 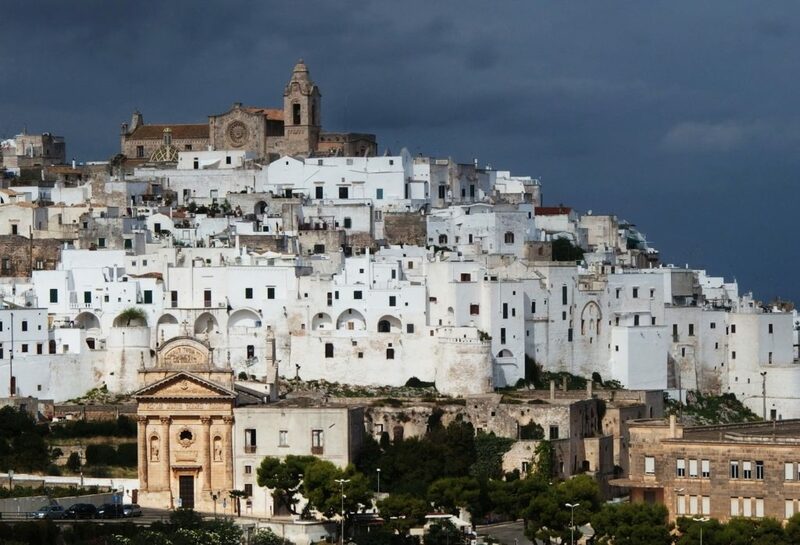 Because of the bright white painted houses Ostuni is called 'la Città Bianca'. 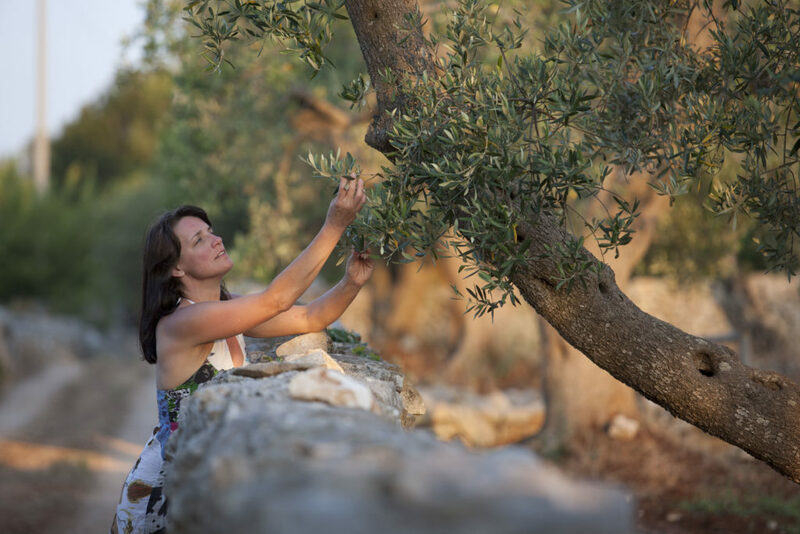 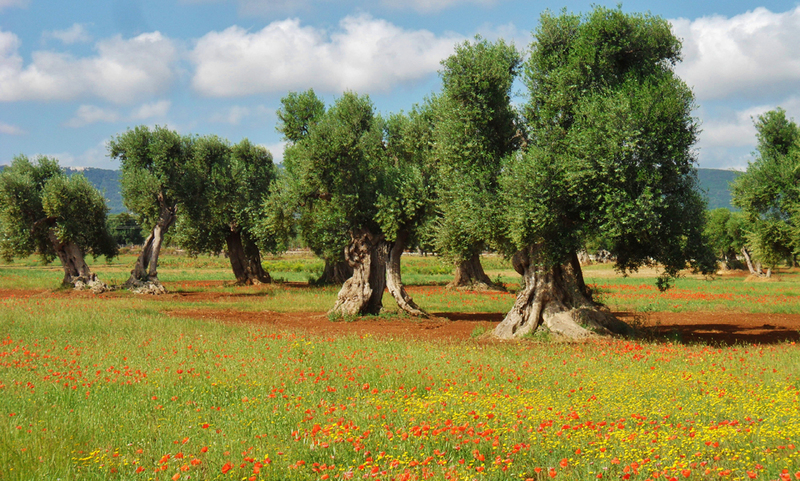 This vivid and enjoyable town is surrounded by olive orchards. 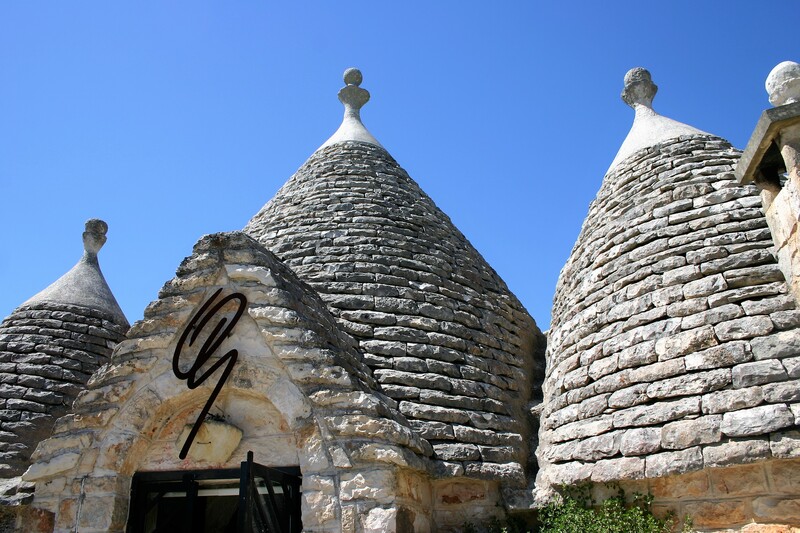 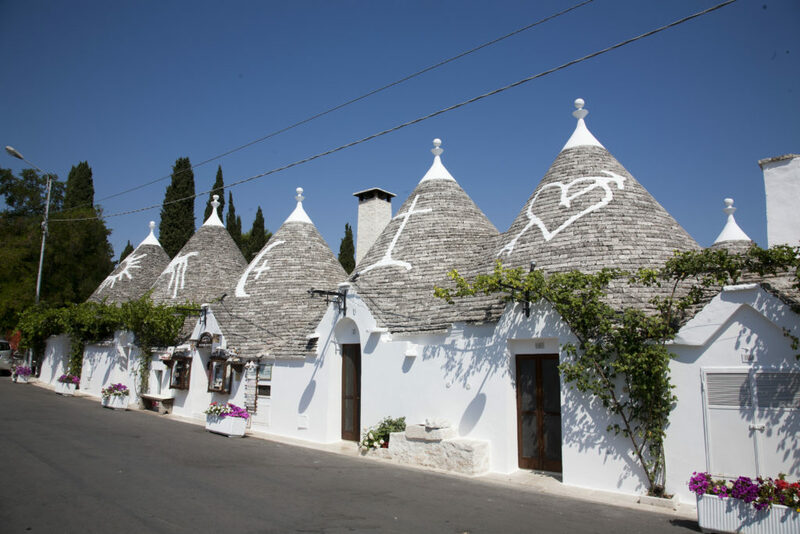 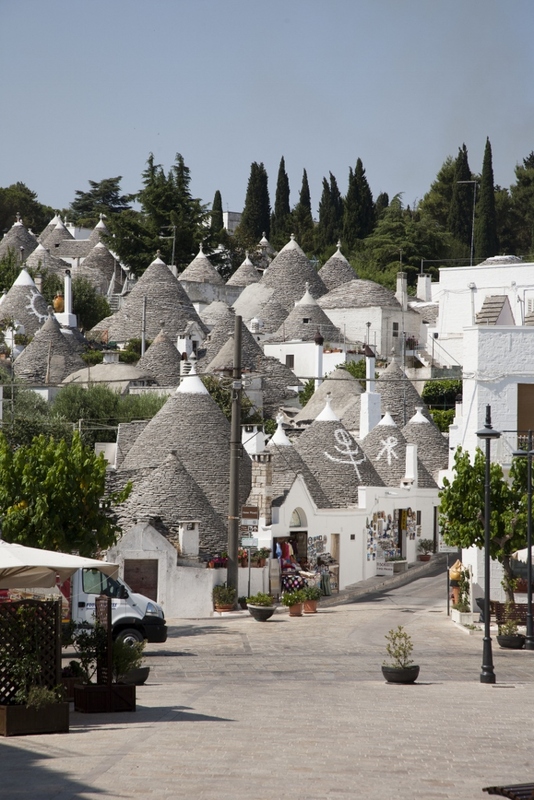 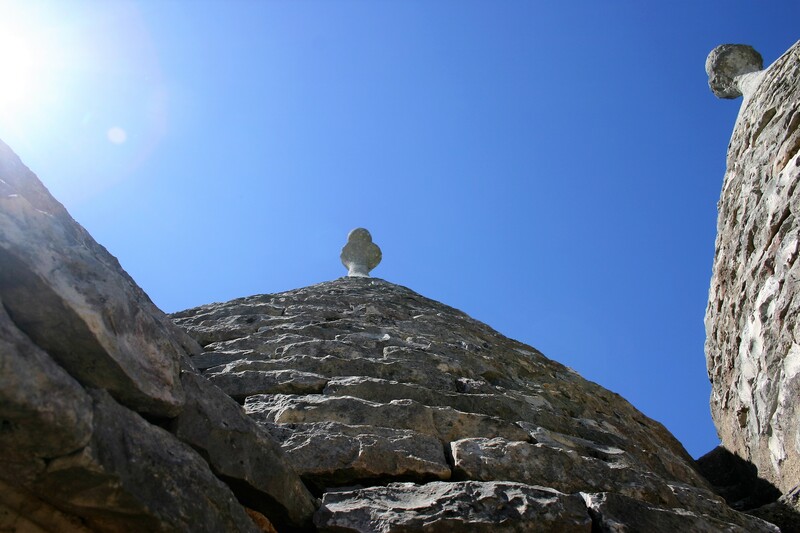 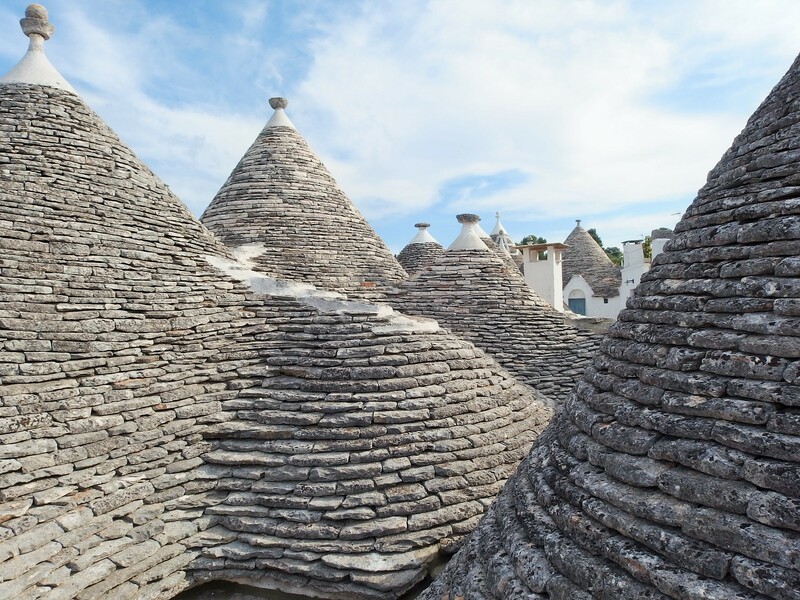 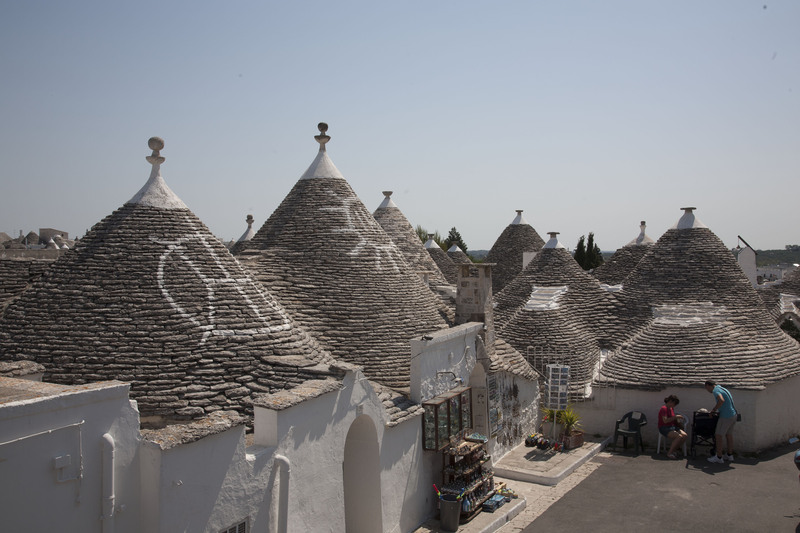 In the suburbs “Rione Monti” and “Aia Picola” in the town of Alberobello there are mainly trulli. 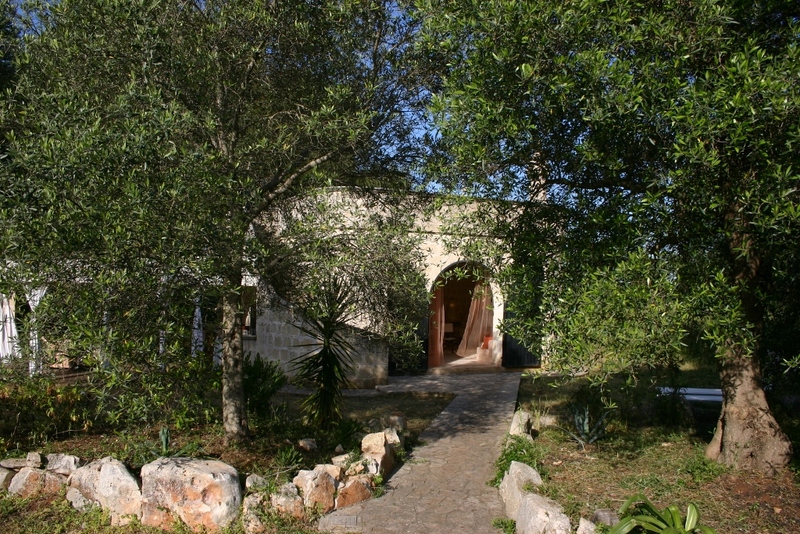 There is even a church and a two storey house in this typical architectural style. 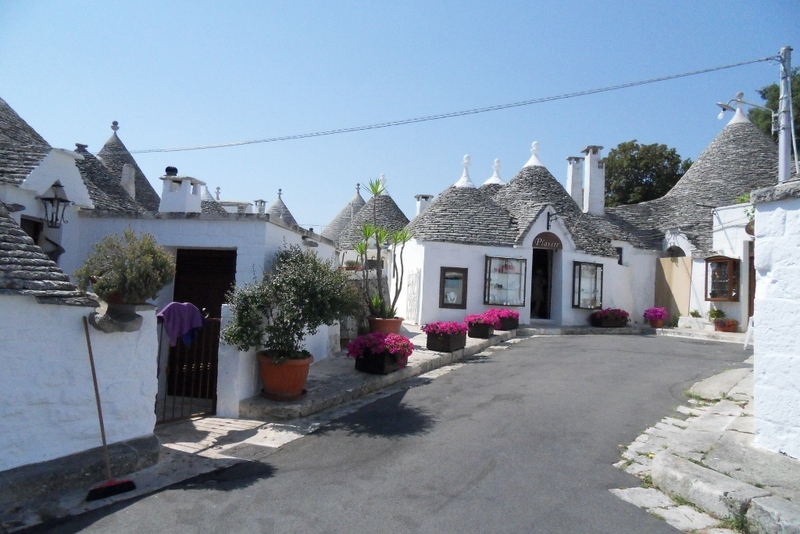 The old monumental part of the town is on the Unesco World Heritage List Yes, Alberobello is touristic but very worthwhile a visit. 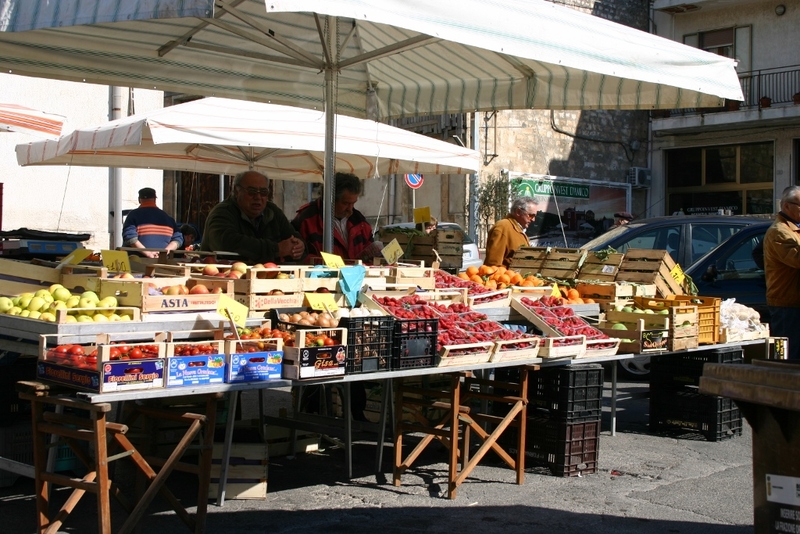 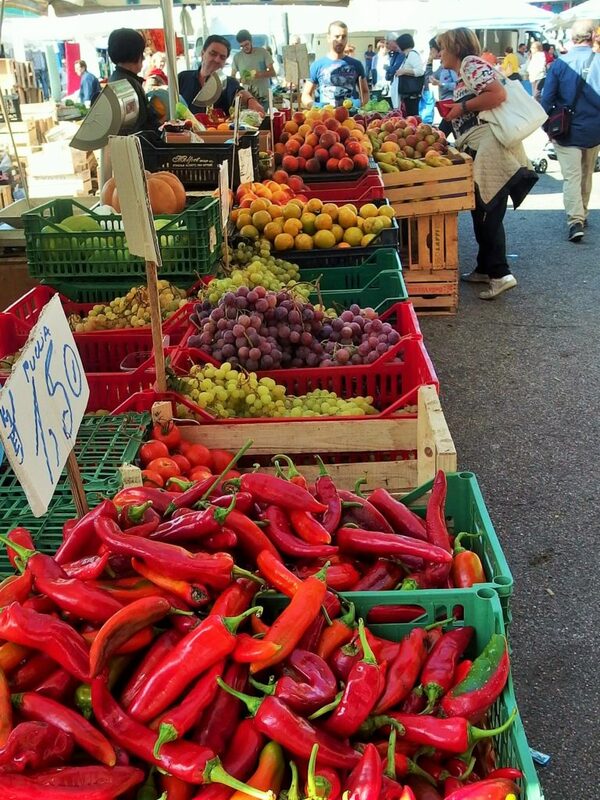 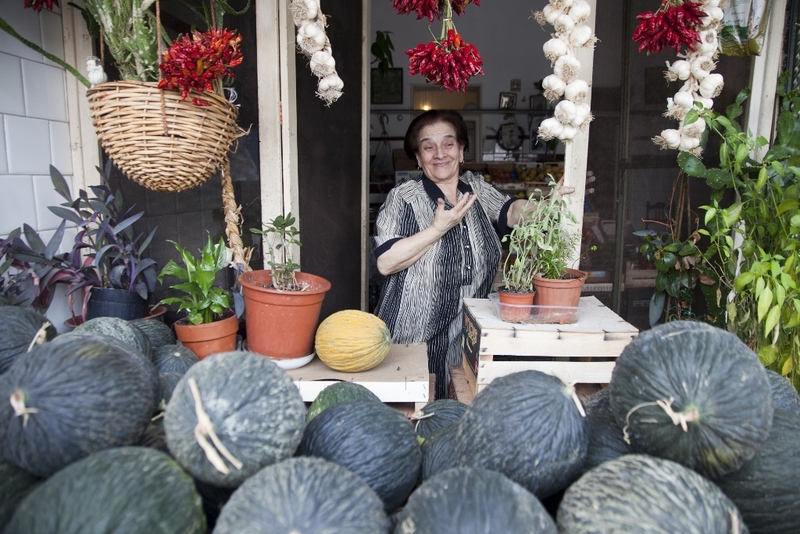 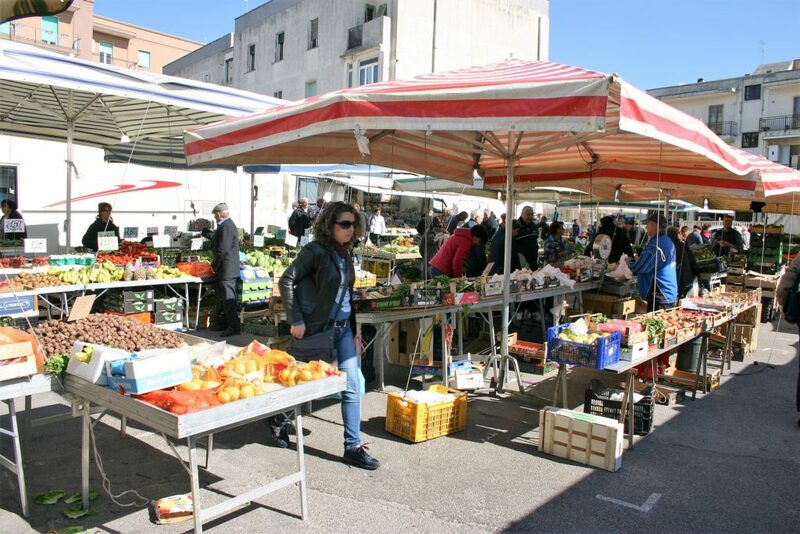 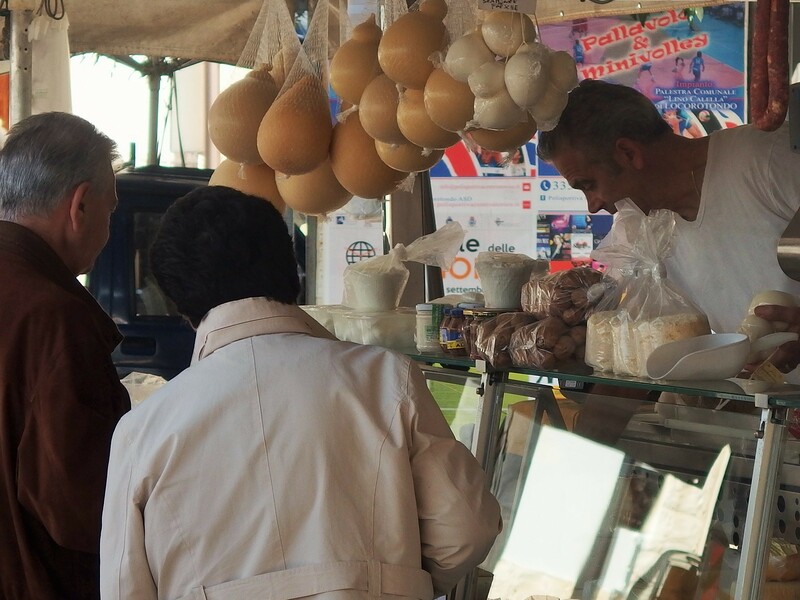 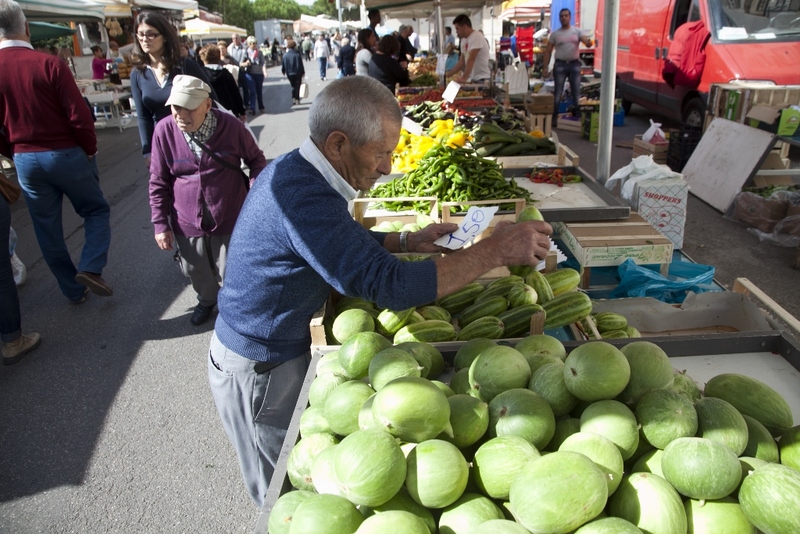 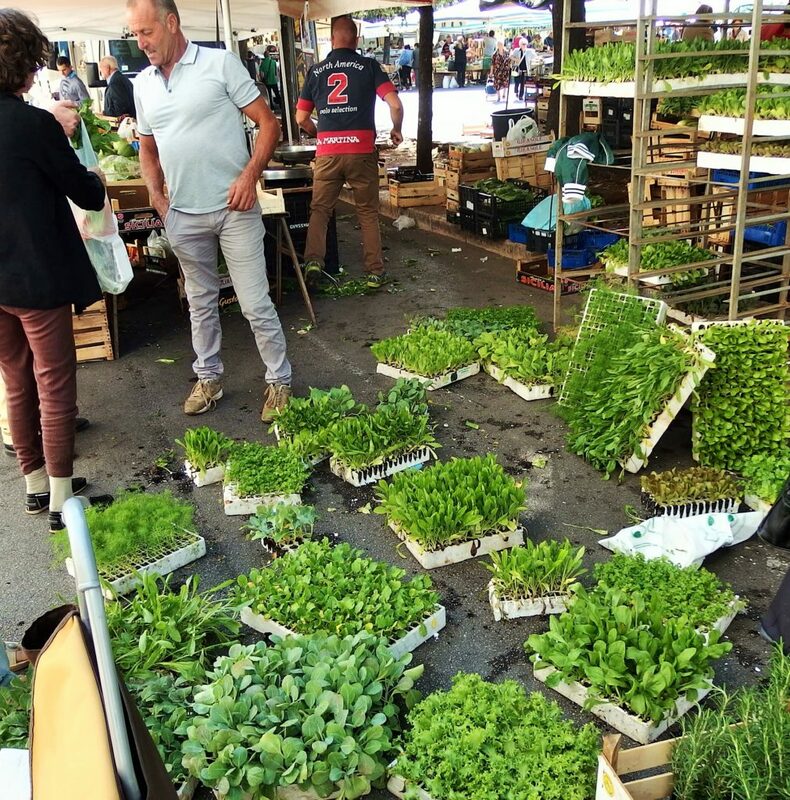 We also recommend a visit to Locorotono, Martina Franca, Ceglie, Cissternino and Fasano for their daily farmer markets. 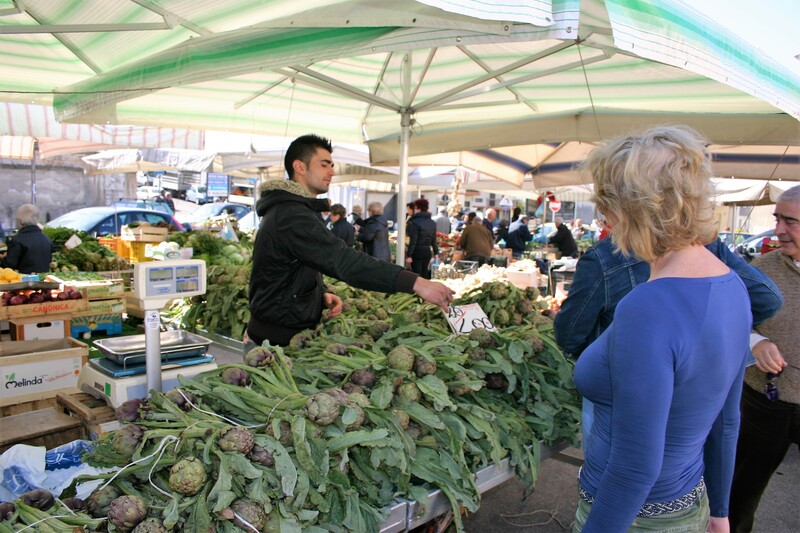 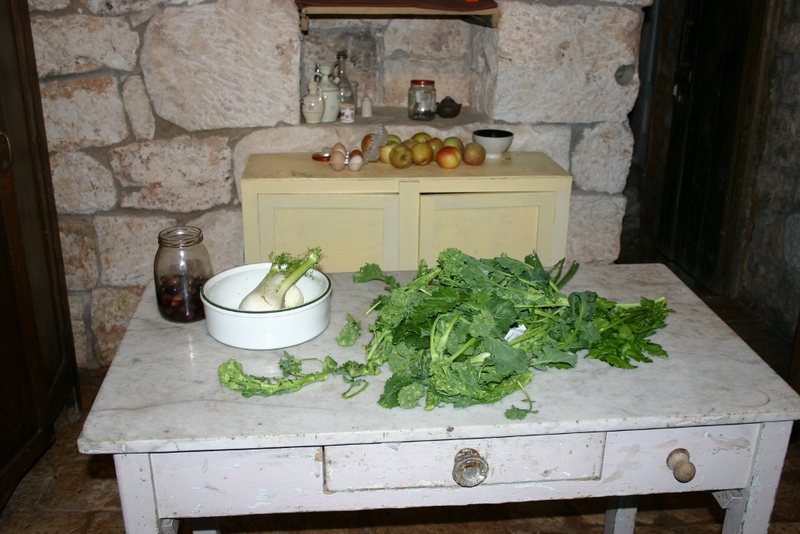 They offer a huge number of fresh, local products for your meals. 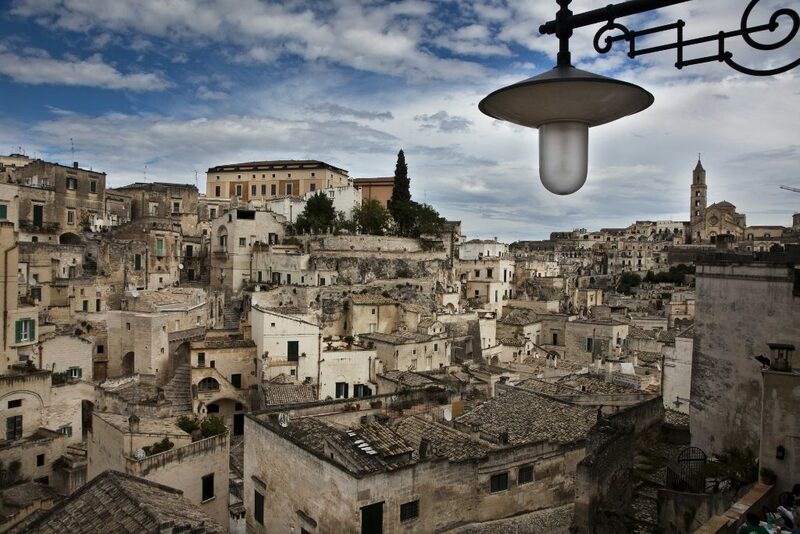 Matera has been inhabited since the stone age. 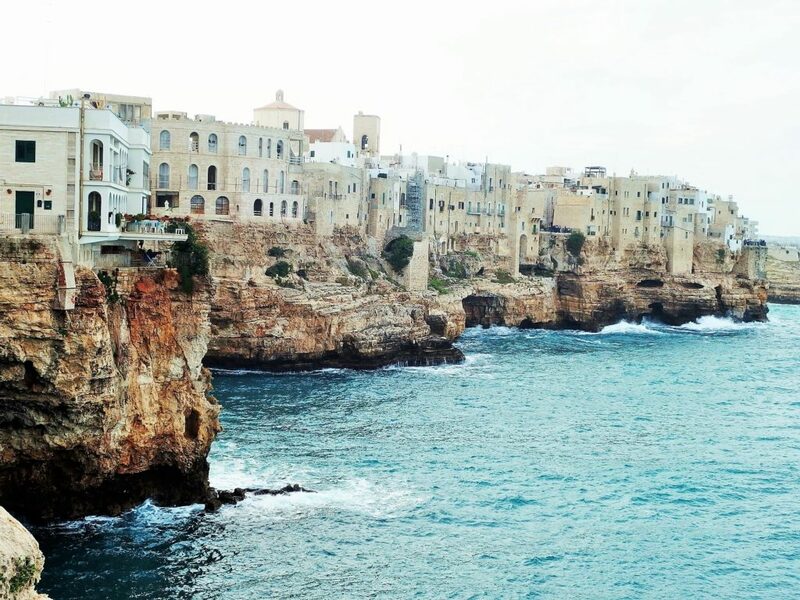 It is a unique spot with its houses cut out in the rocks. 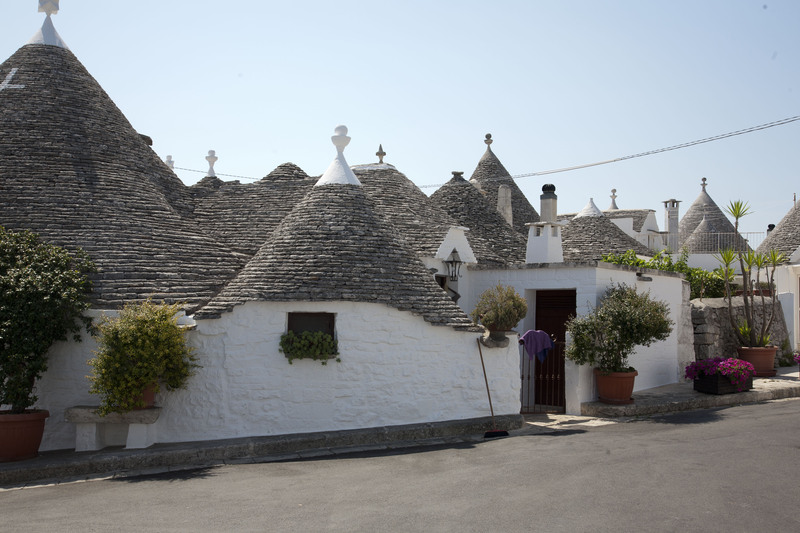 It is that these exceptional houses and the special position of the town which makes it a favourite setting for several movies. 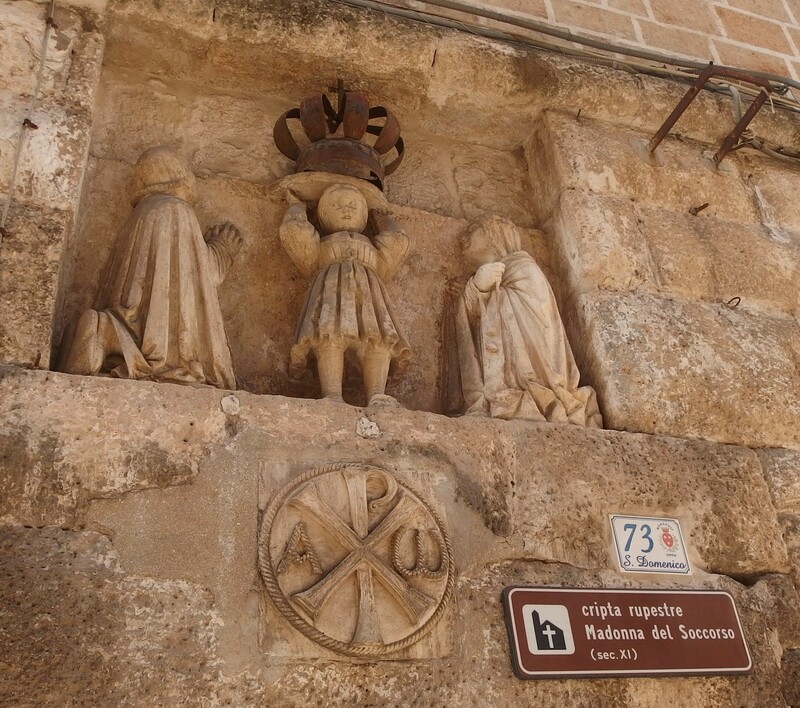 Matera is also on the Unesco World Heritage list. 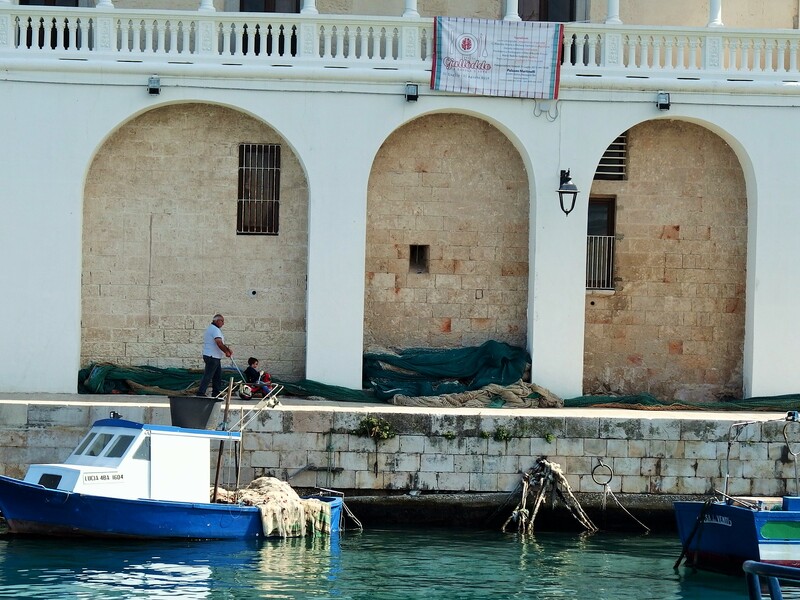 Taranto is a port on the Gulf of Tarente. 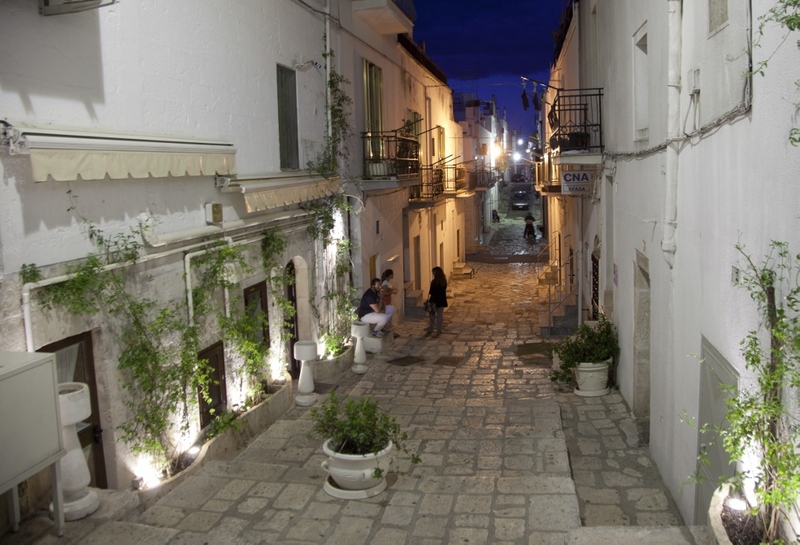 This pretty capital city of Apulië has a long history which goes back to old Greek times. 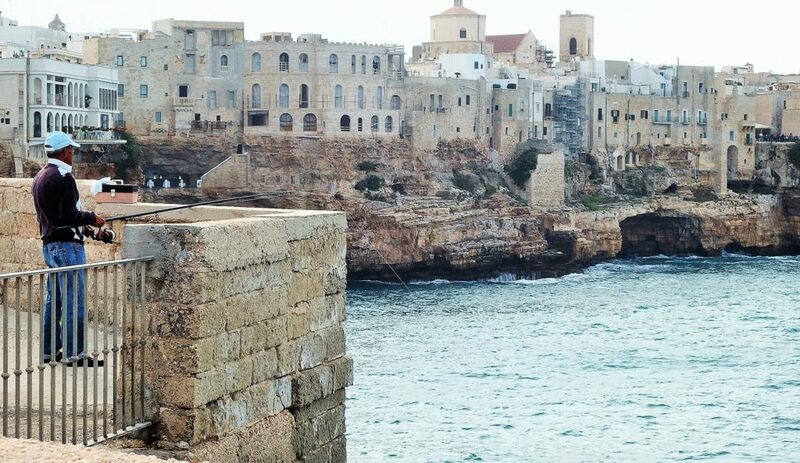 The city situated on a spit of land is also called “the city of two seas” while the split divides the sea in the 'Mare Grande' and the 'Mare Piccolo'. Lecce is more southwards in the heel of Italy. 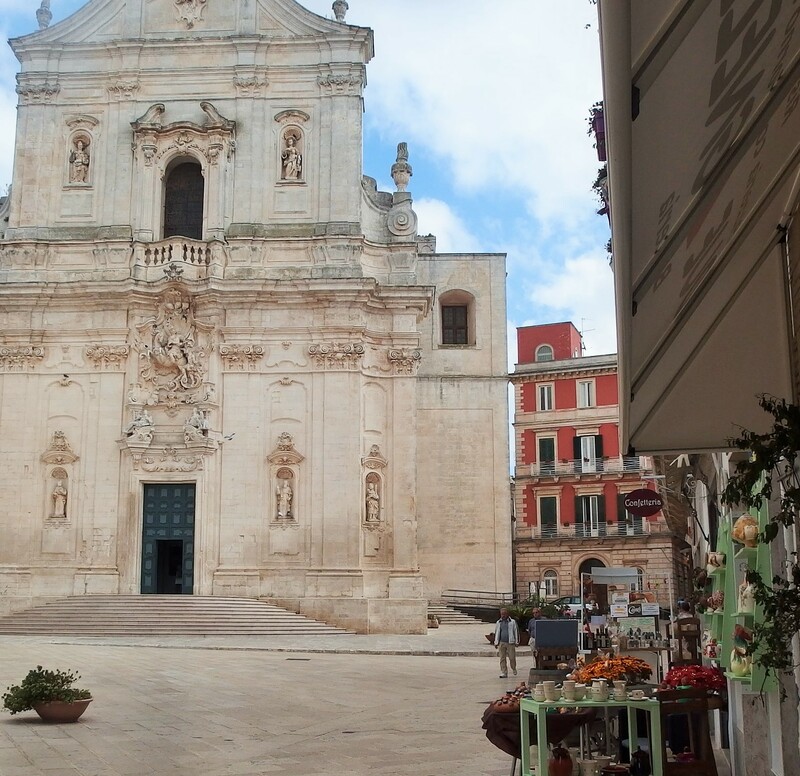 With many monuments from the 16th century is known as 'Florence of the Baroque'. 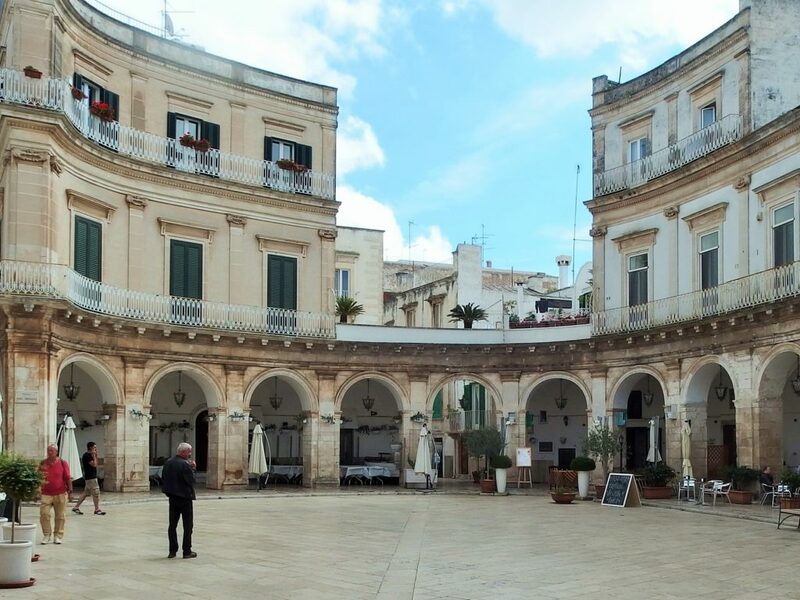 In the time of ancient Rome it was a ﬂourishing city with a big amphitheatre. 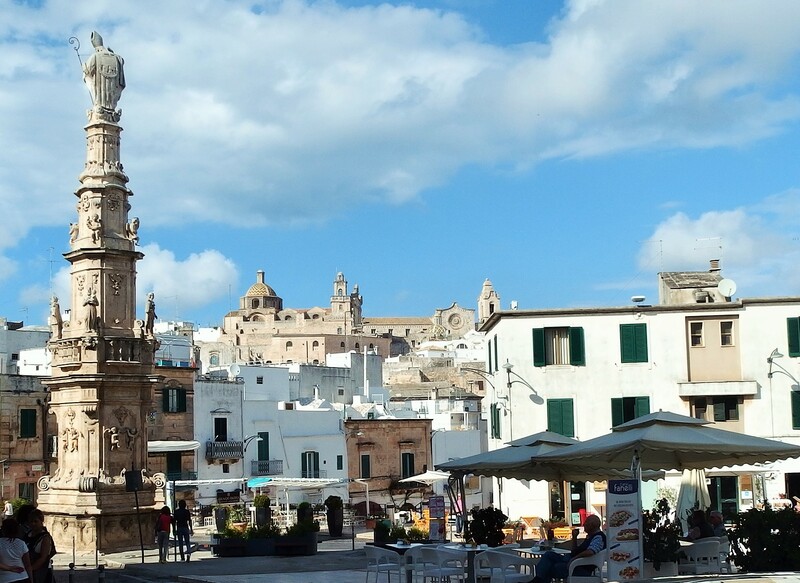 After the Romans, came the Saracen, then the Vikings and a long, long row of counts and countesses who ruled the city. 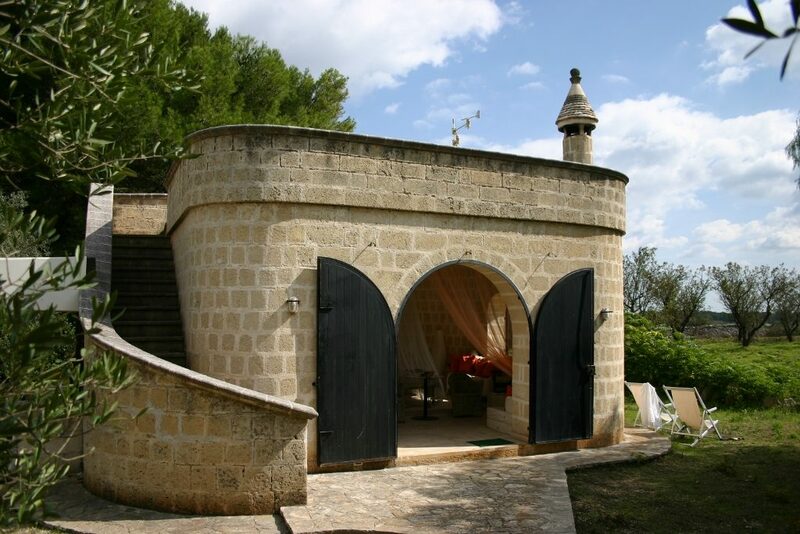 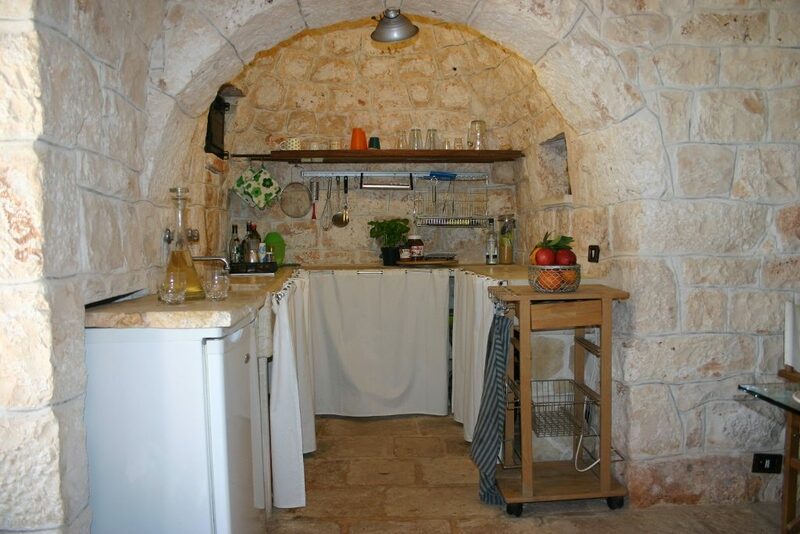 In our trullo and lamia is a ﬁle with detailed information of the nearby area. 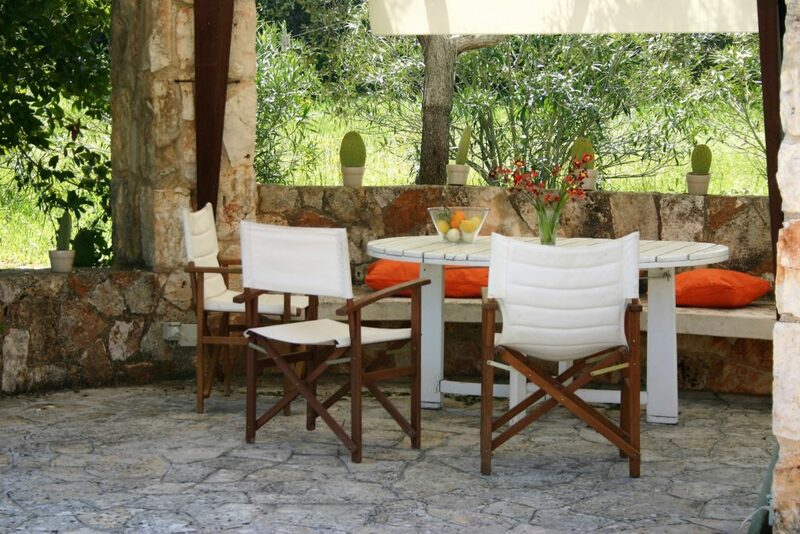 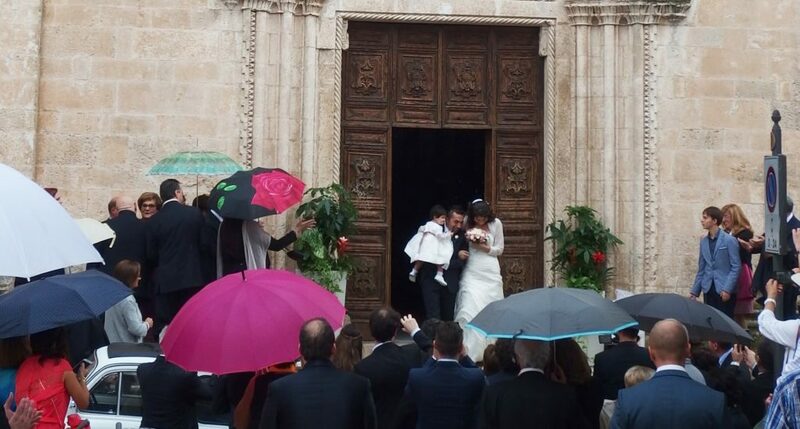 As you see there is a lot to enjoy, but don’t forget to enjoy the rest and space around our trull and lamia as well! 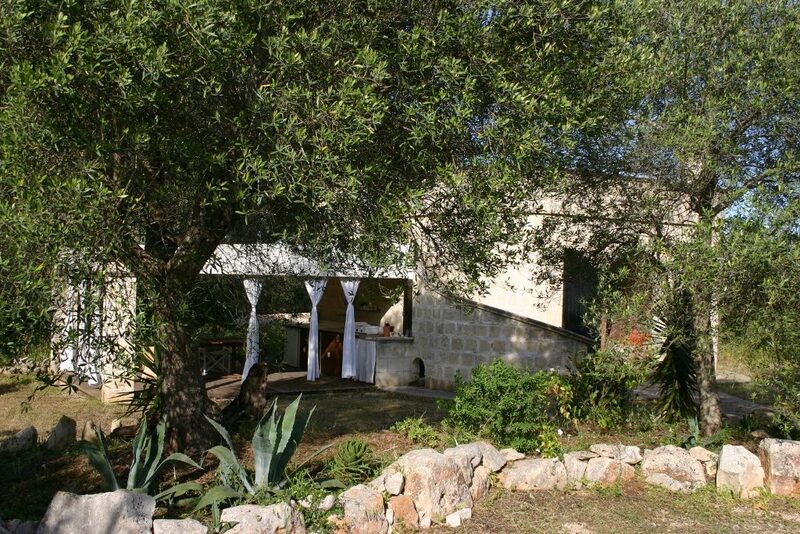 On the calendar below you can see if the cottage of your choice is still available. 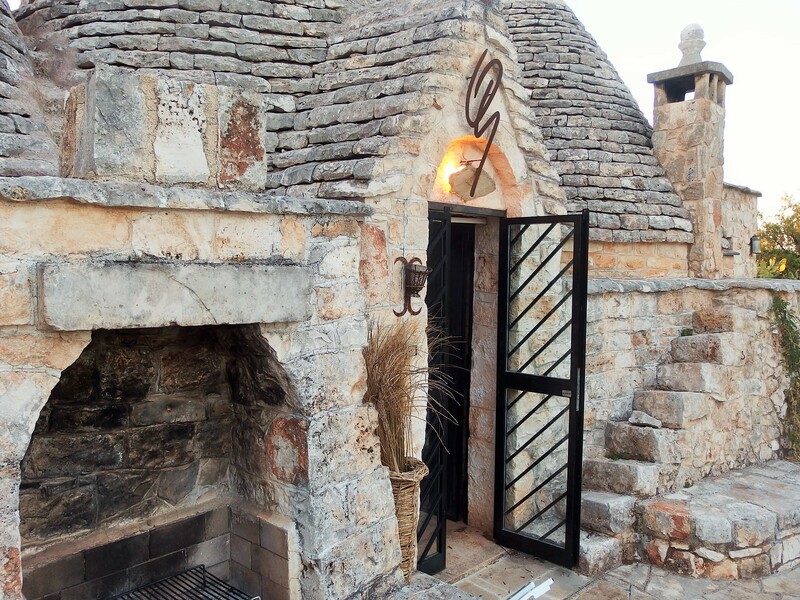 With the form, which is under each calendar you can make a reservation. If you still have any questions, please contact us by telephone or email. 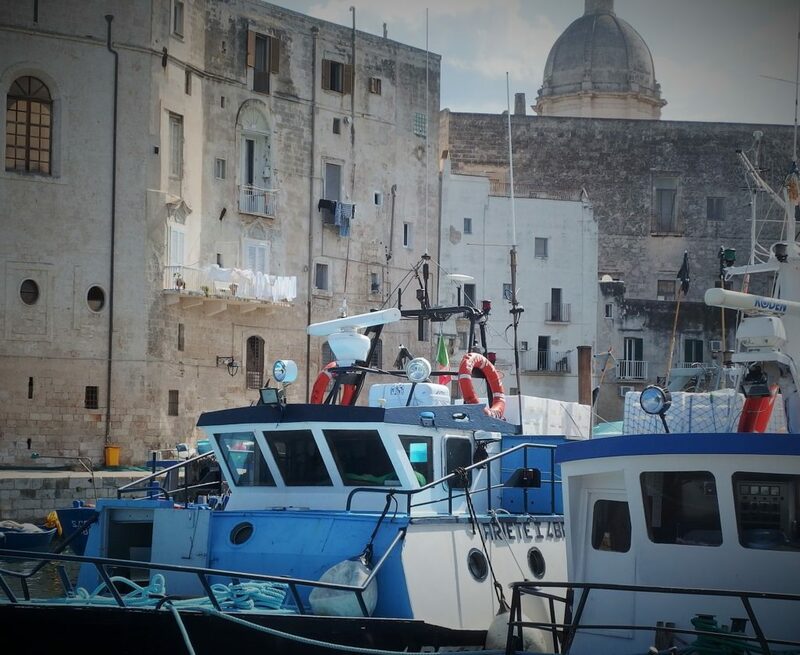 Costs of cleaning € 45 per week. 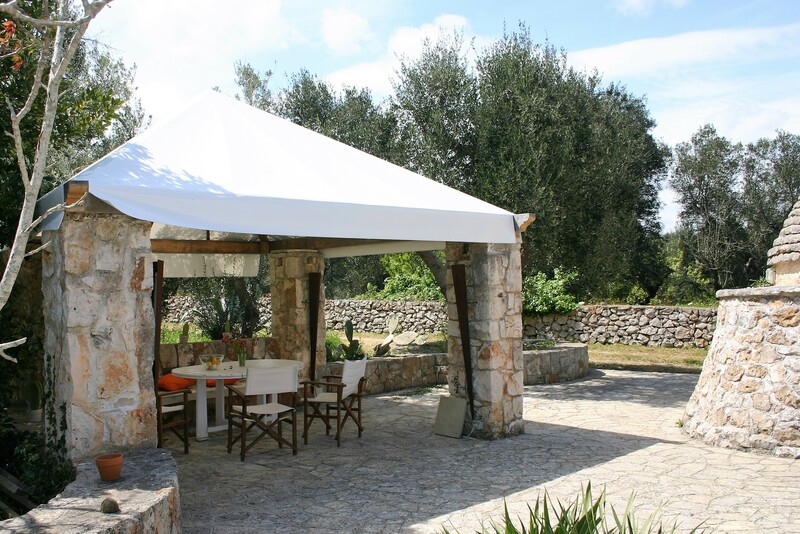 If the booking is for longer than a week, we charge € 15 for clean sheets for every week after the ﬁrst week. 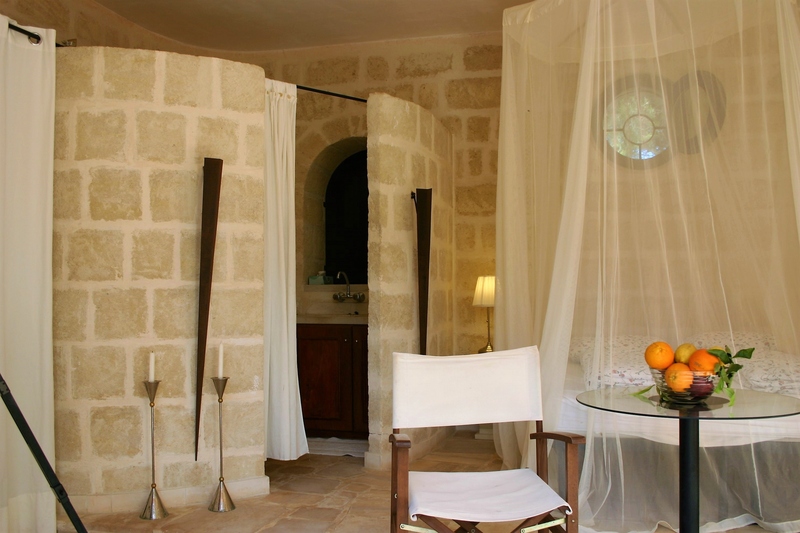 Costs of cleaning € 45 per booking. 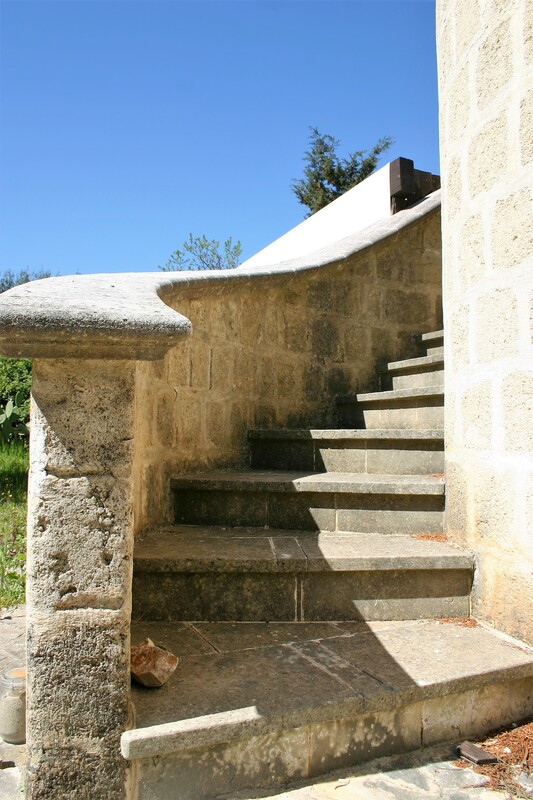 Under the map you can read how to get there. 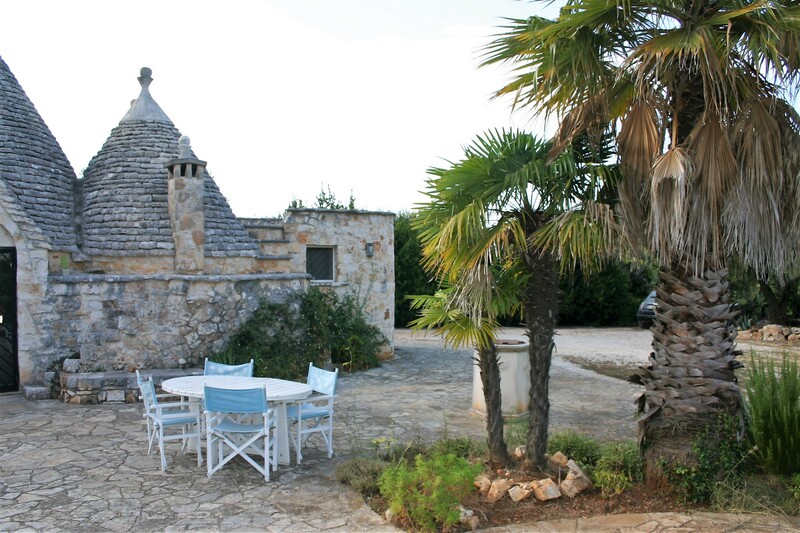 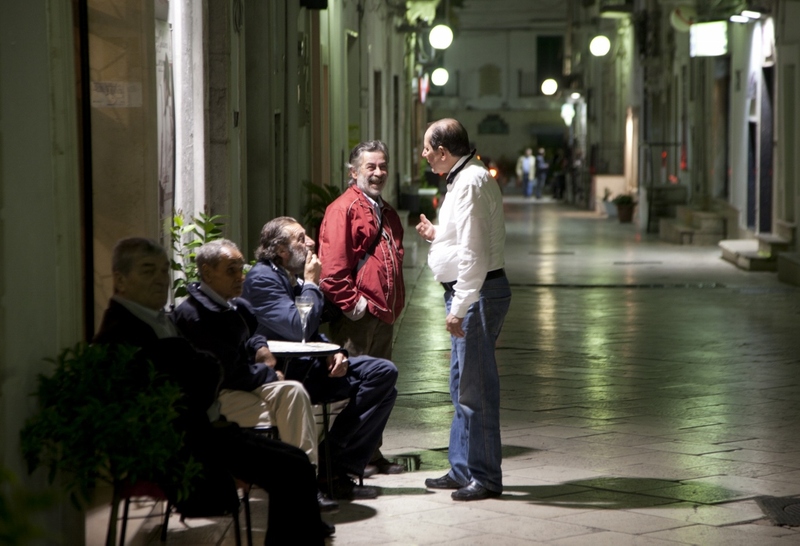 The airports of Bari and Brindisi are quite nearby Trullo dell'Attore. 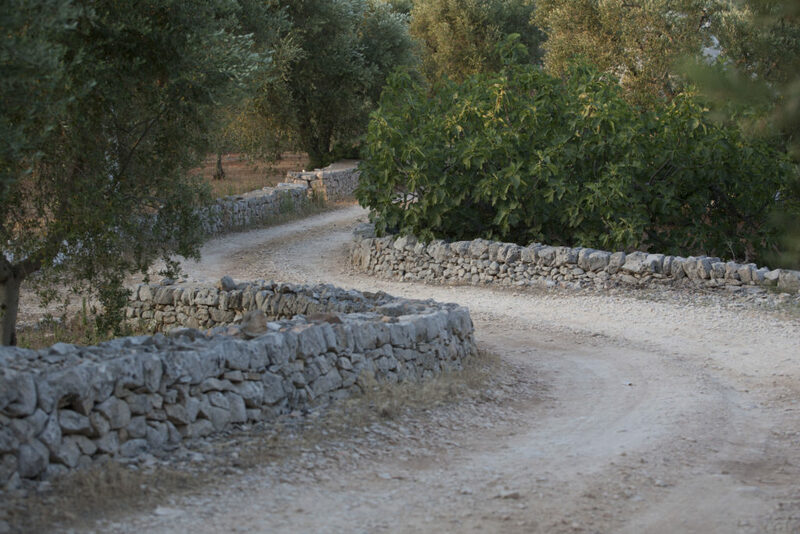 As the trulo and lamia are in a rural area, it is recommended to hire a car.